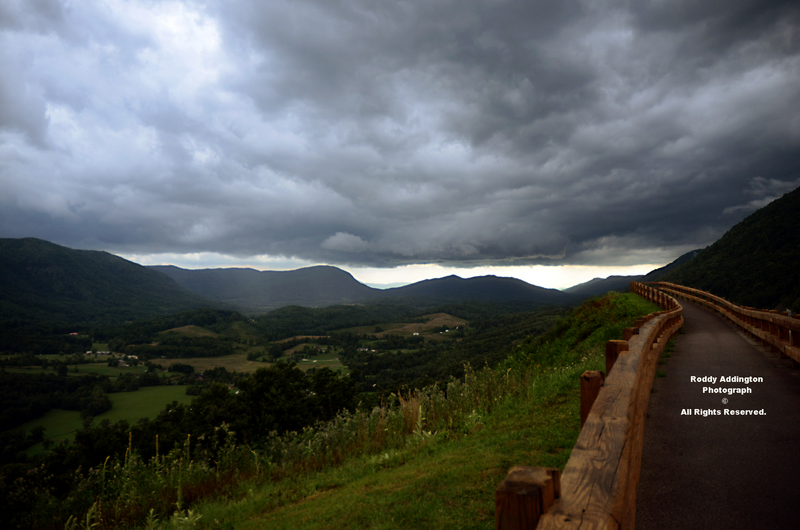 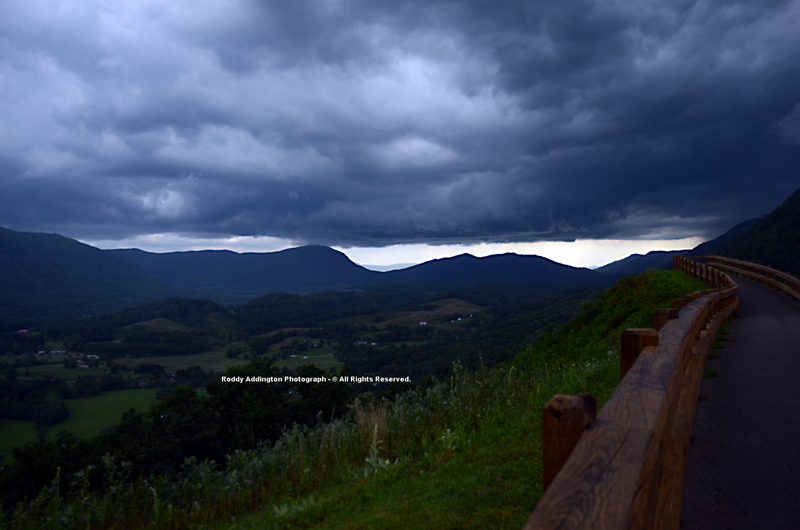 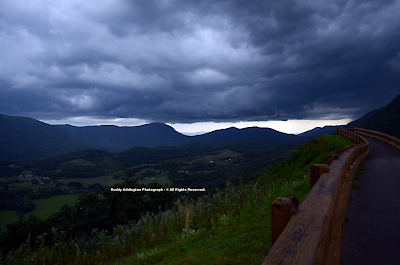 Turbulent skies of a classic "Whales Mouth" spread across Powell Valley in Wise County, Va., during afternoon hours of July 19 as outflow from approaching thunderstorms lifted unstable, moist air above the majestic Valley. 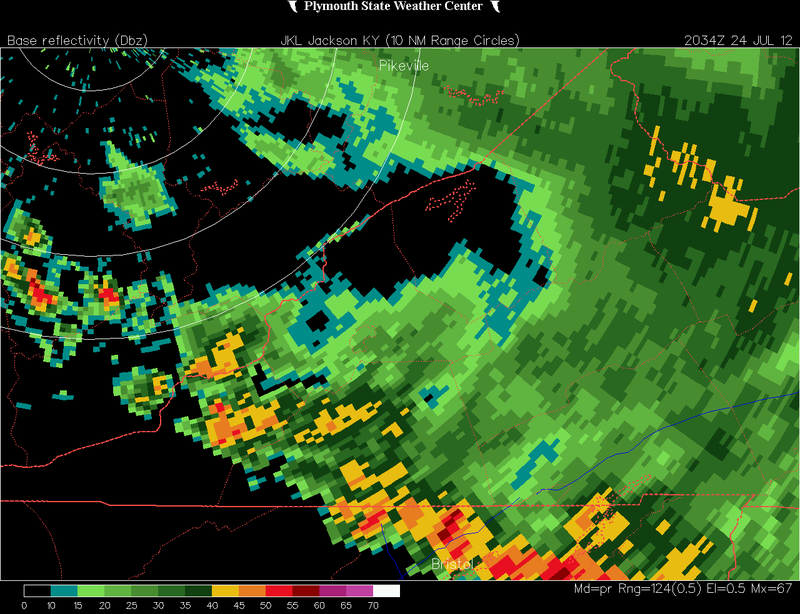 This next time series will illustrate how Roddy got behind the gust front and into the "Whales Mouth" of turbulent air by around 5:50 PM on July 19. 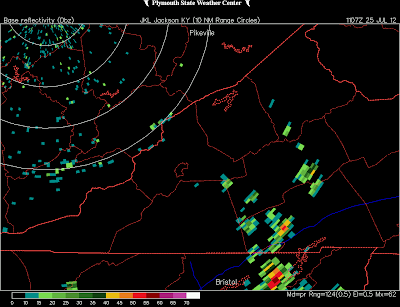 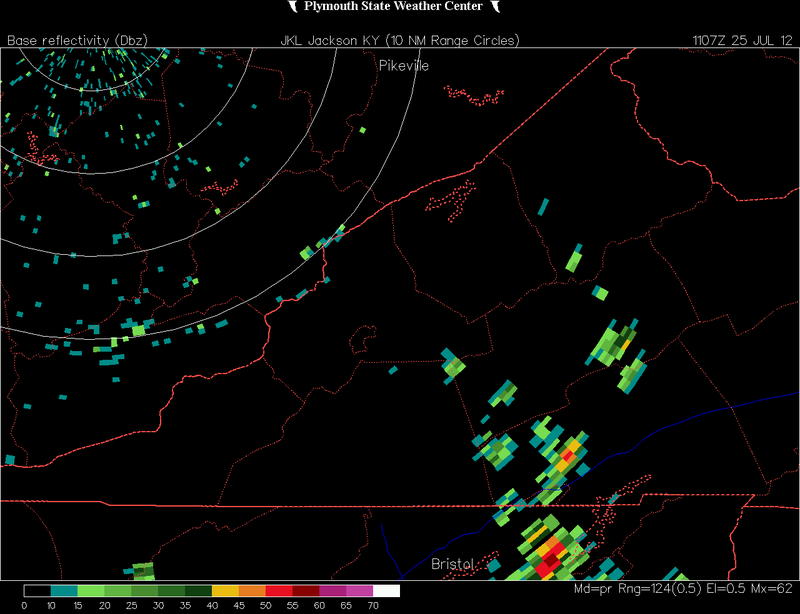 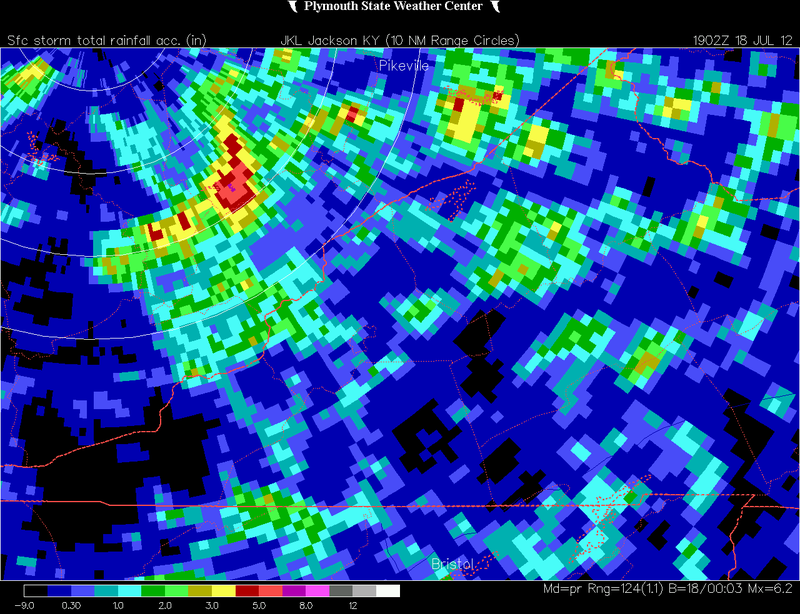 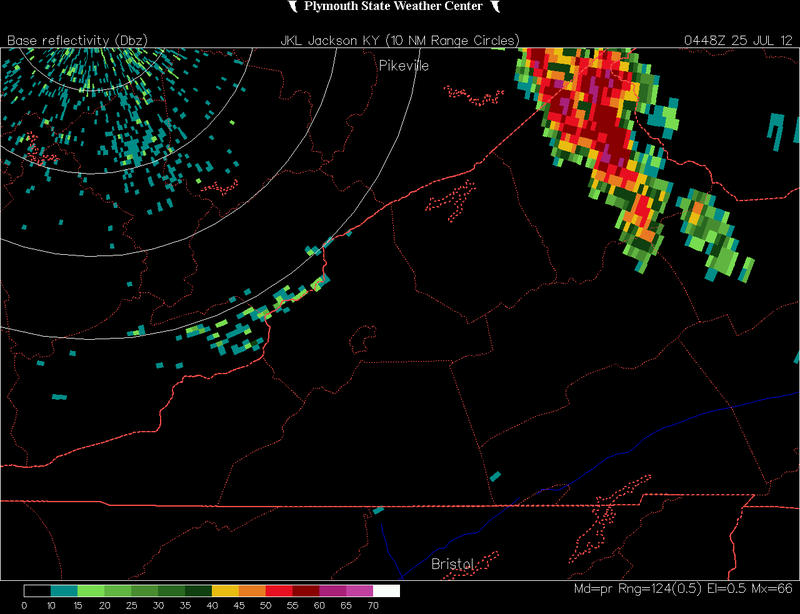 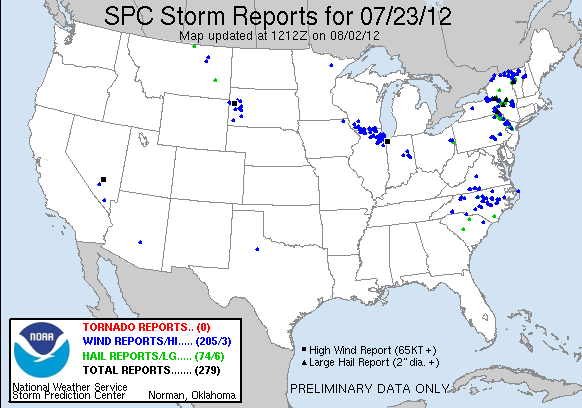 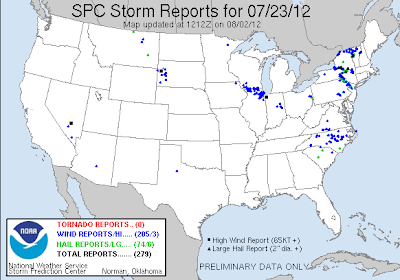 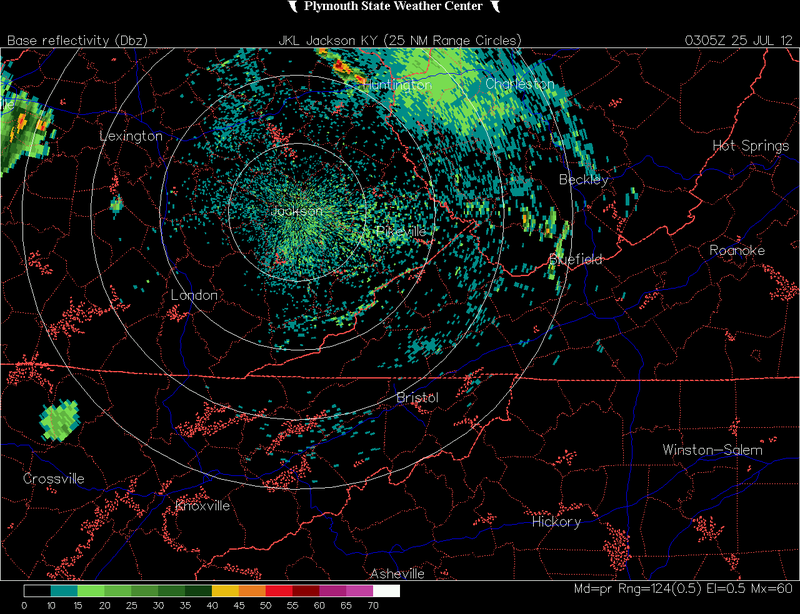 Like so many days this month, mountain generated thunderstorms were the first to develop with increasing afternoon heat. 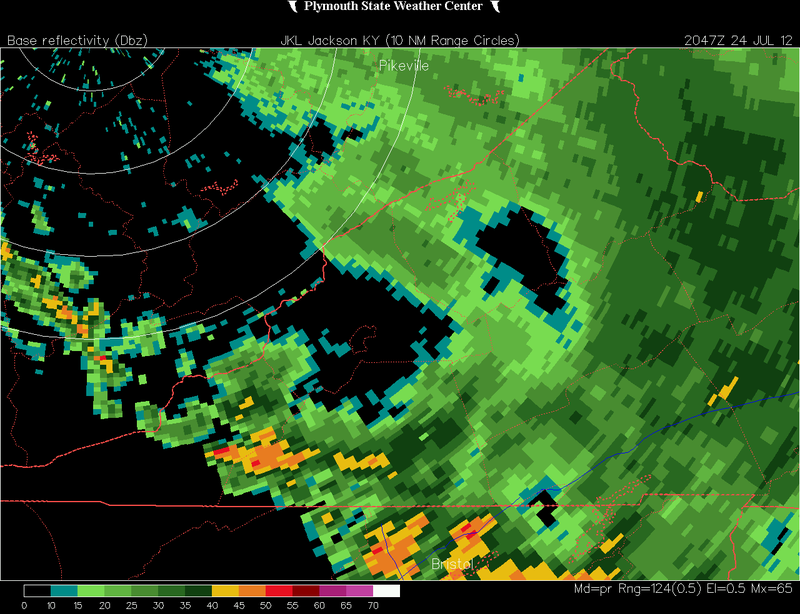 Observe in upcoming frames that a blue line appears along top of screen to mark outflow gushing from a MCS ( Mesoscale Convective System ) developing southward across eastern Kentucky toward the mountains. 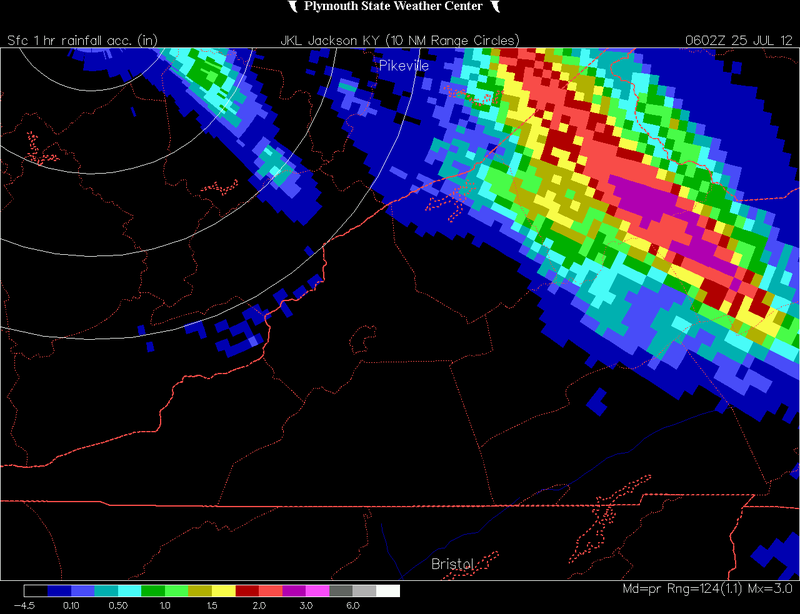 ( the small red line on the map ) and Powell Valley. 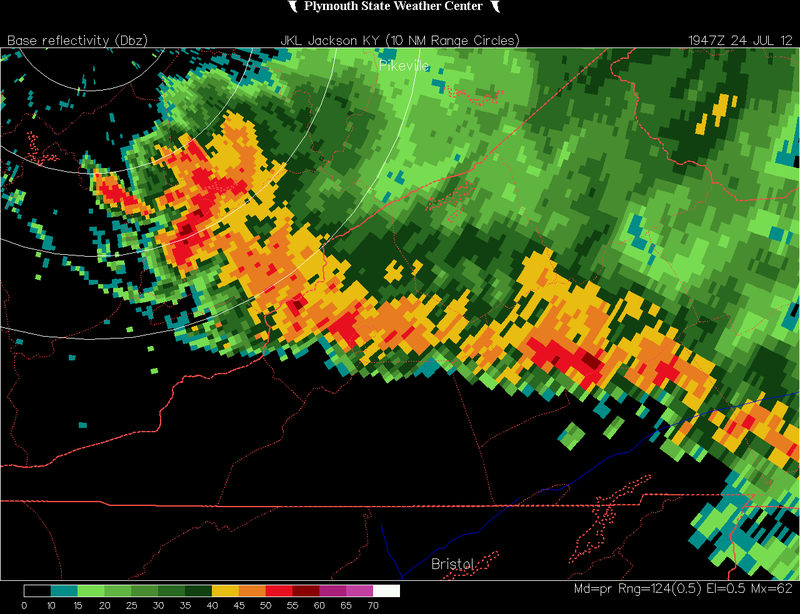 Turbulent shelf clouds of the "Whales Mouth"
had formed during this time. 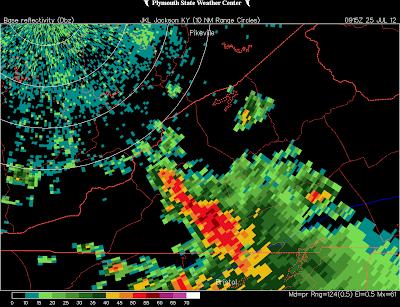 A distinct clearing line in the far distance correlates to the southwest extent of the Doppler Echo Field, while the ominous blackness seen along right side of photograph is associated with the "bright" or heavy Doppler echoes approaching U.S. 23 from the northwest ( a strong thunderstorm ). 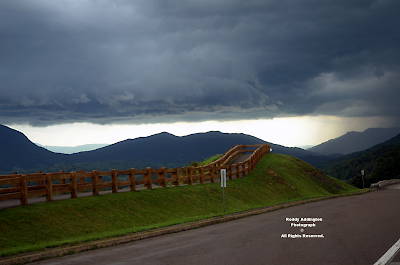 What might appear as a wall cloud in center of this photograph is actually part of the shelf cloud, along the outer portion of the outflow, in advance of a thunderstorm whose heavy rain shaft is becoming visible on the far right of scene. ( as illustrated by following Doppler frames ). 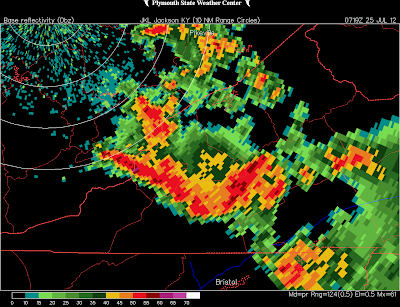 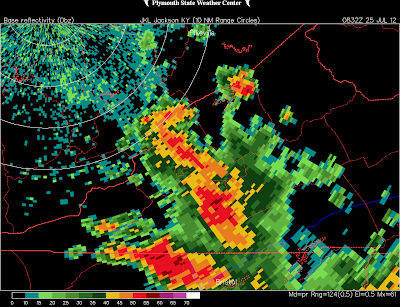 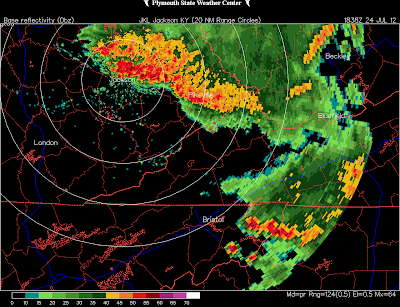 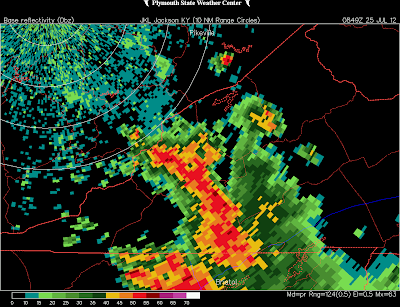 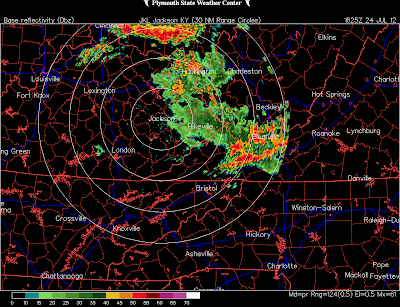 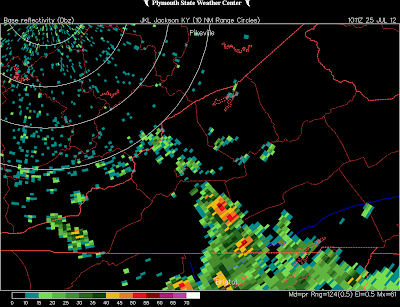 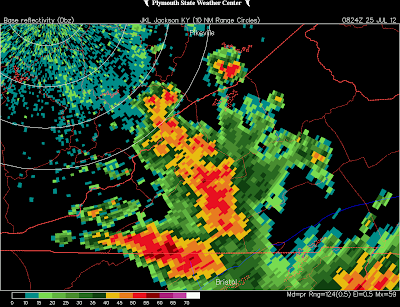 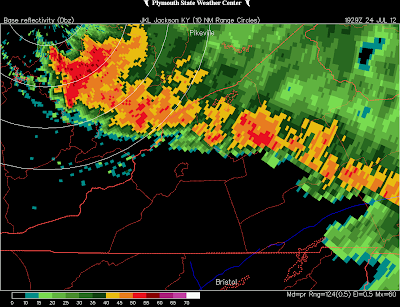 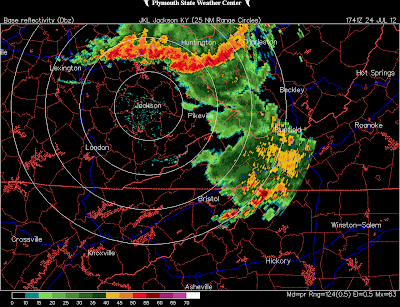 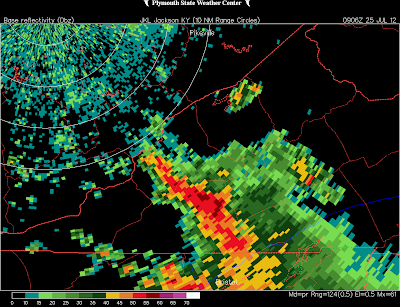 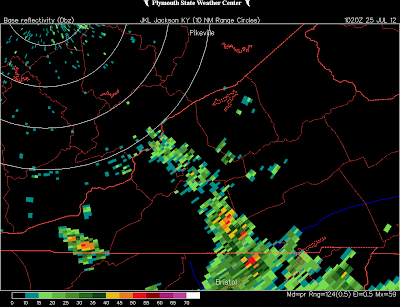 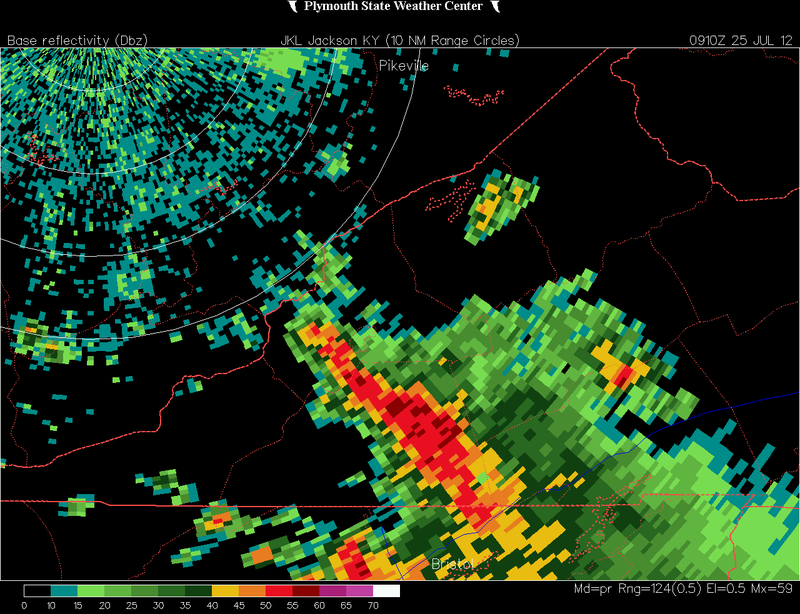 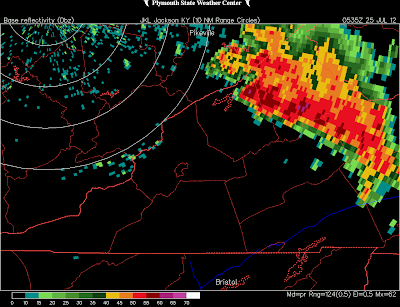 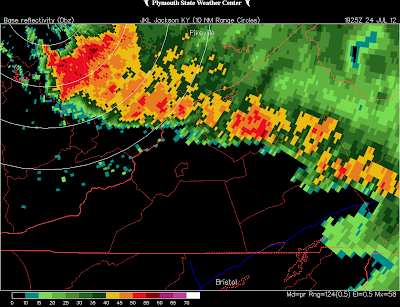 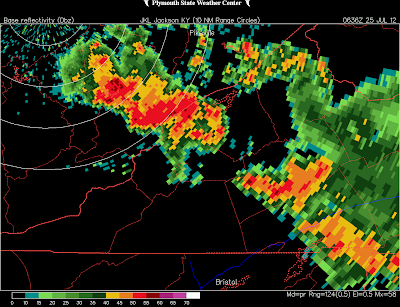 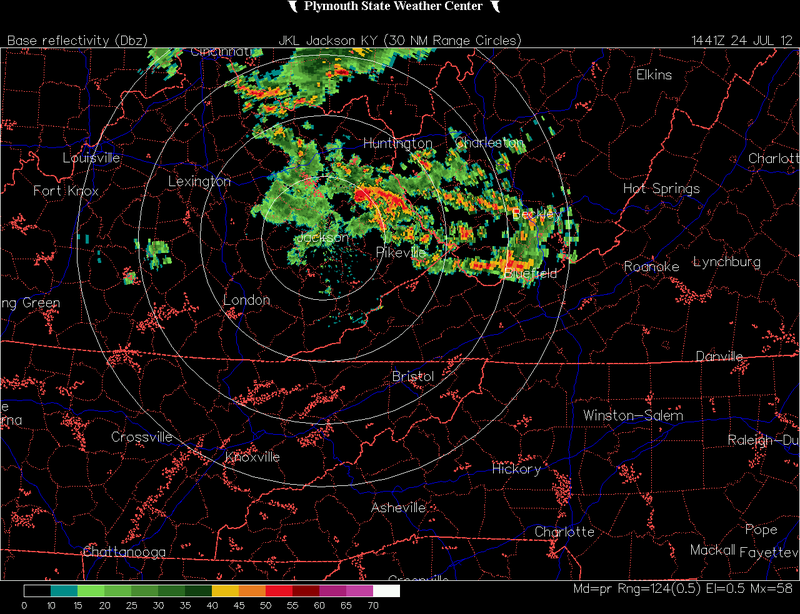 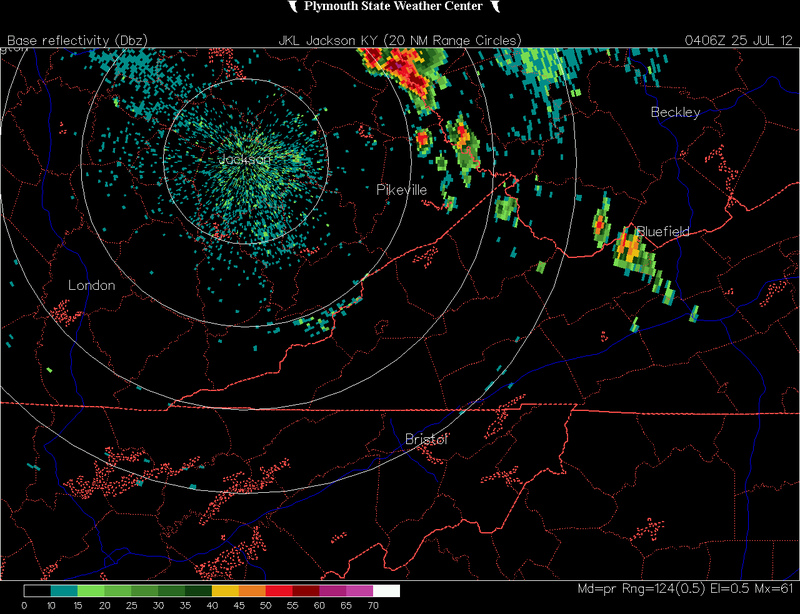 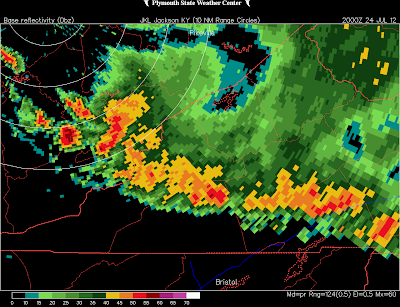 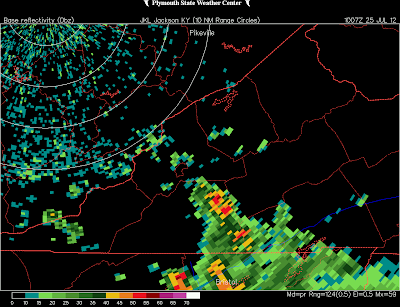 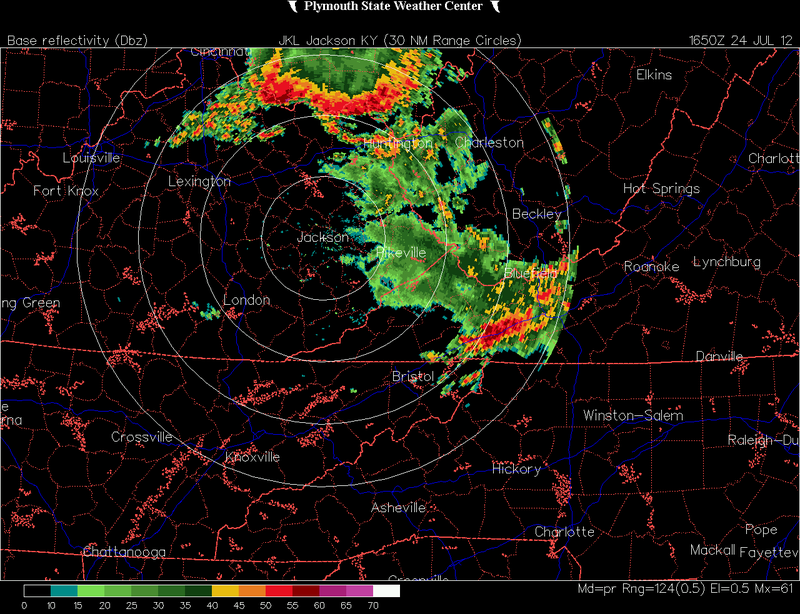 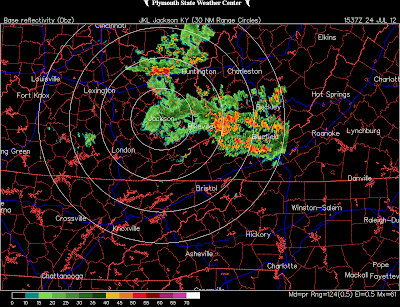 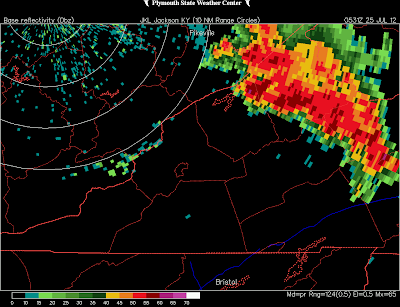 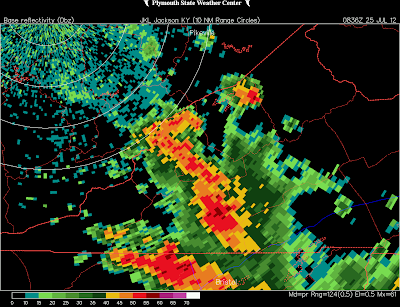 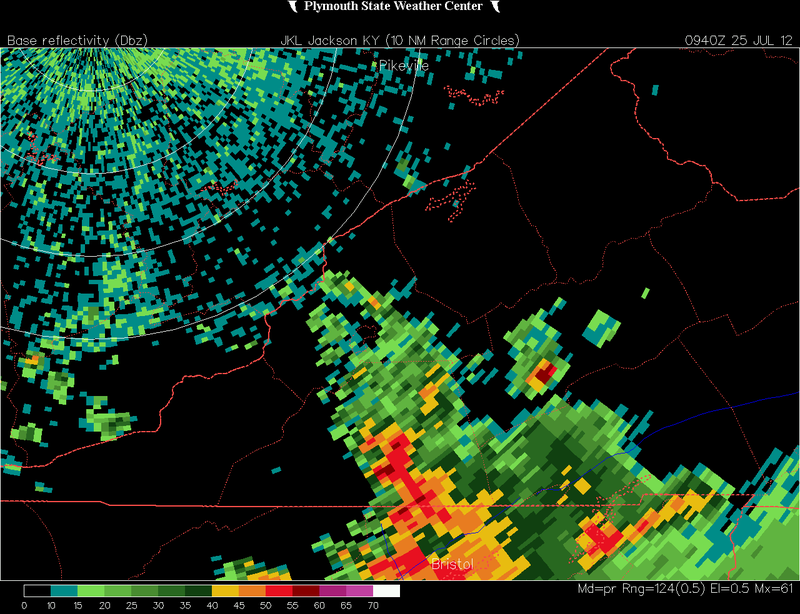 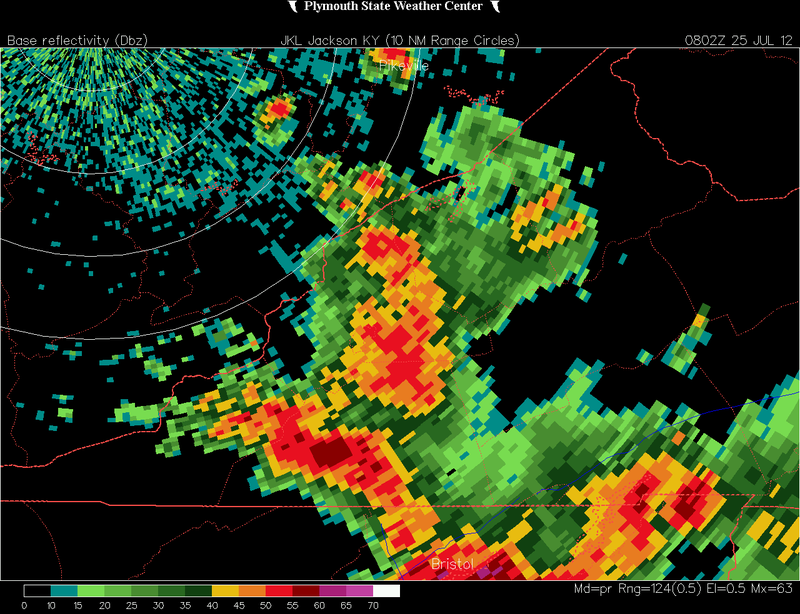 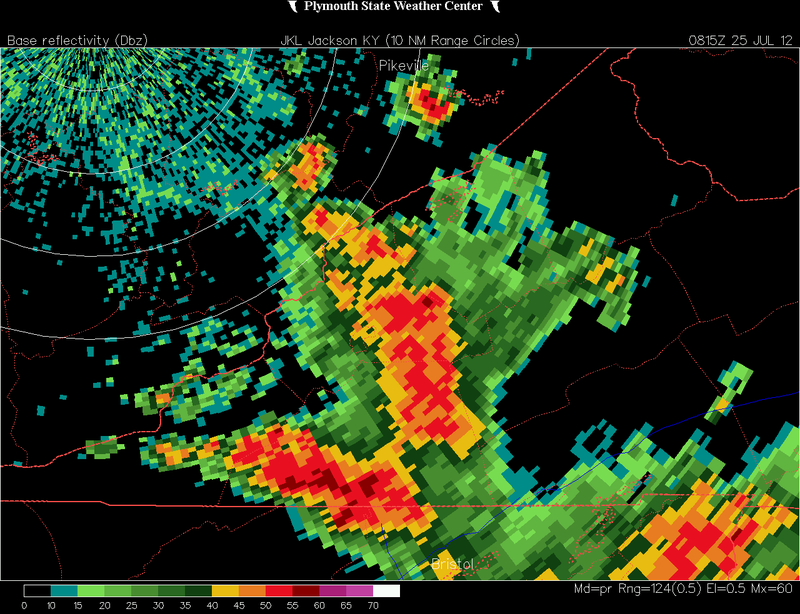 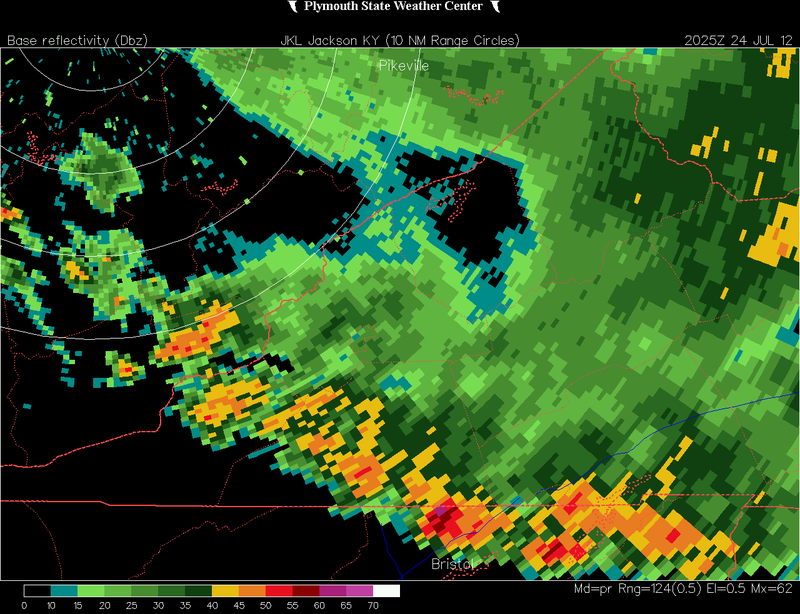 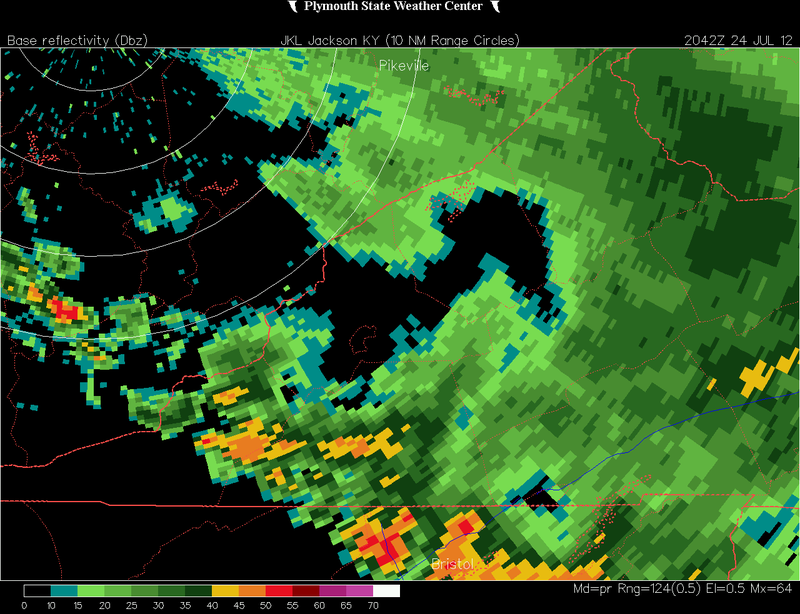 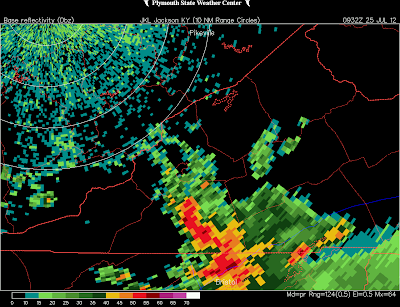 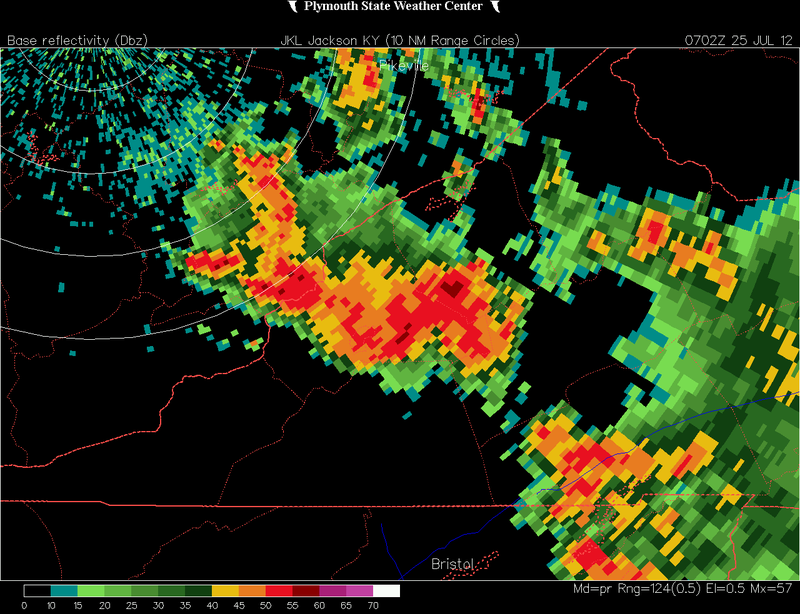 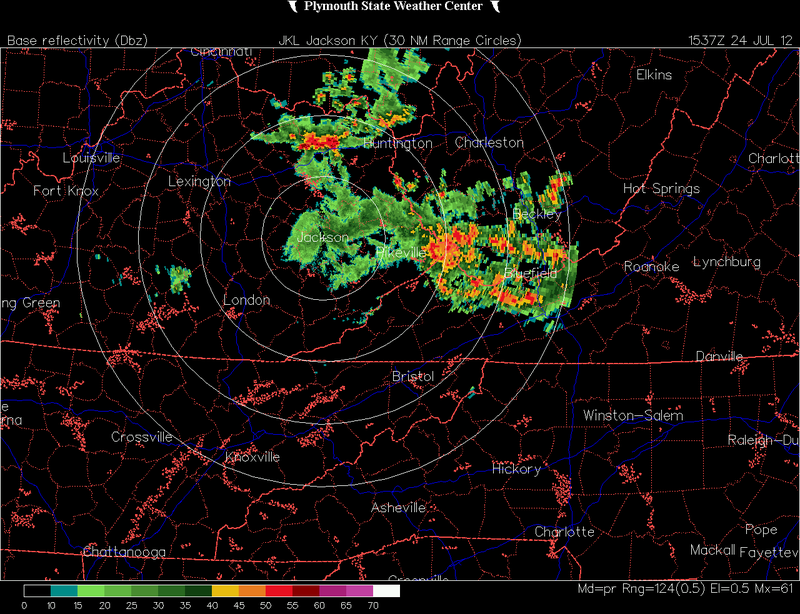 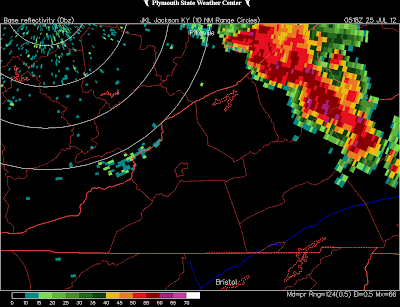 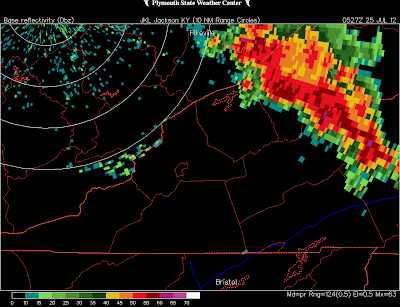 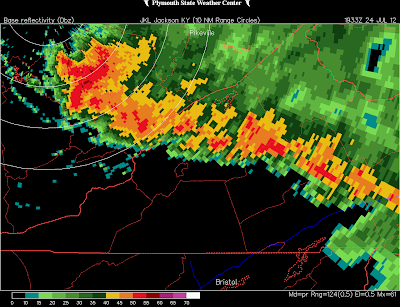 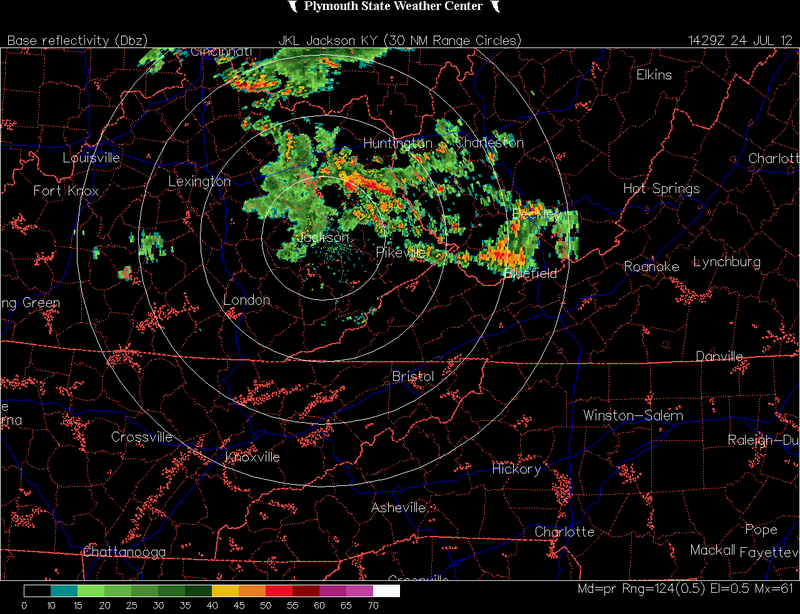 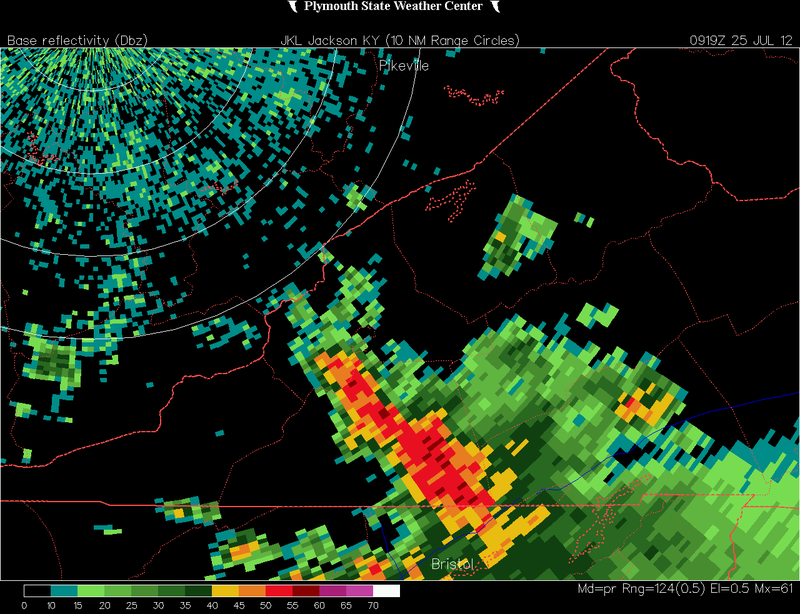 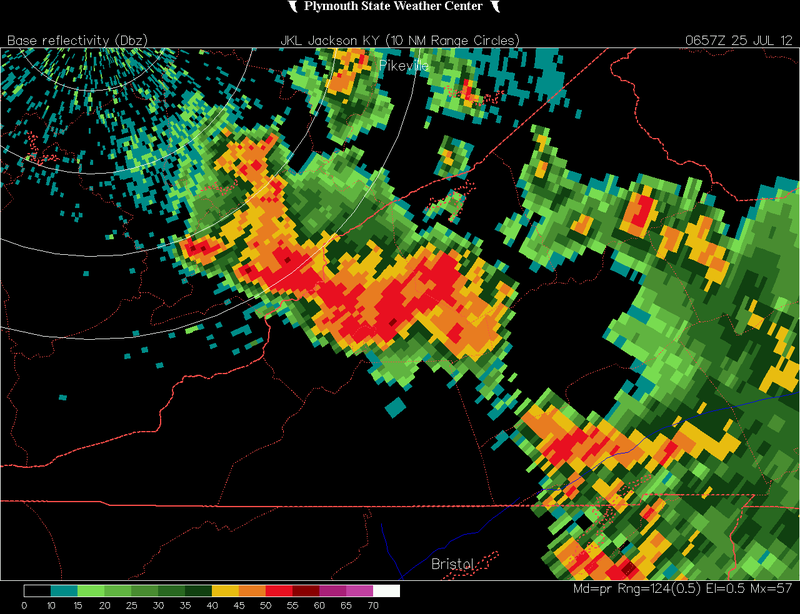 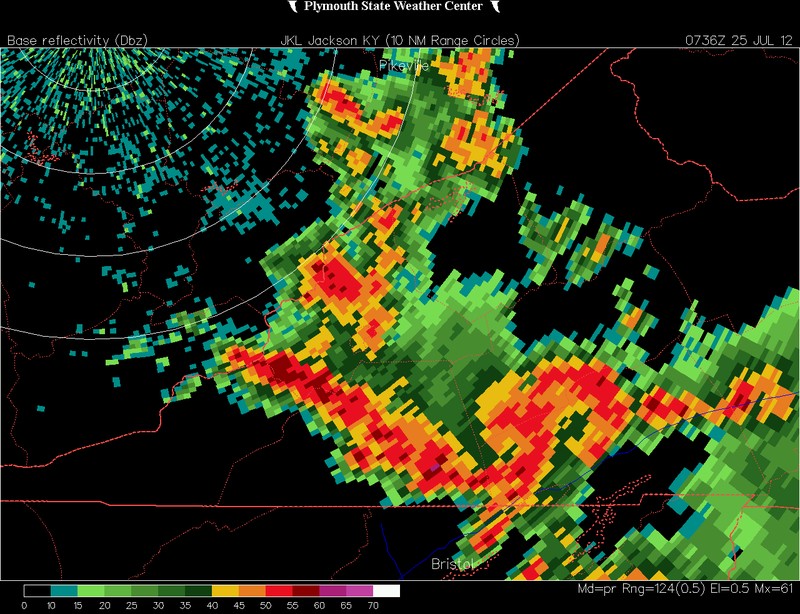 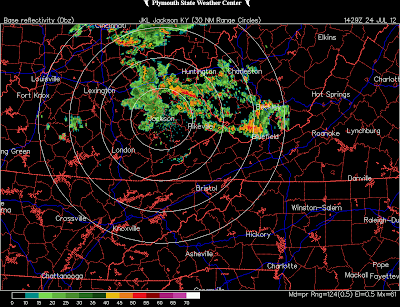 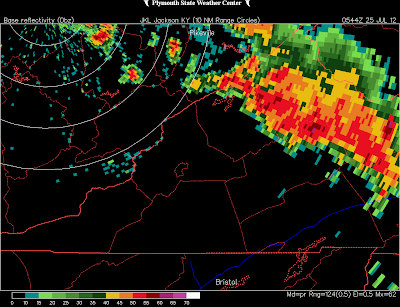 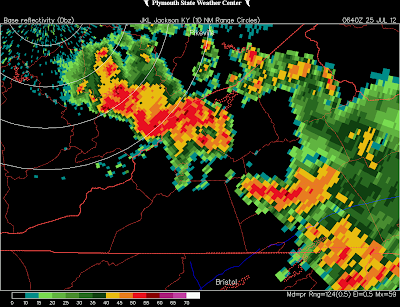 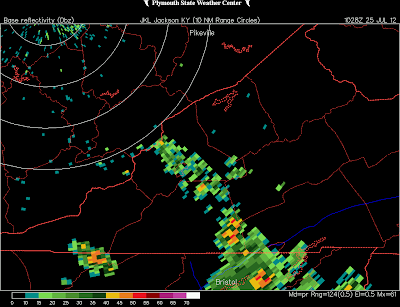 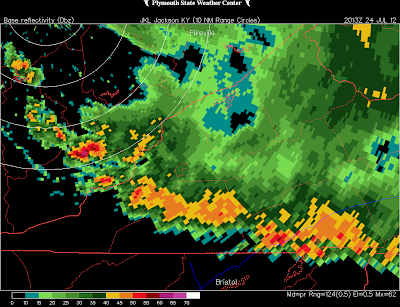 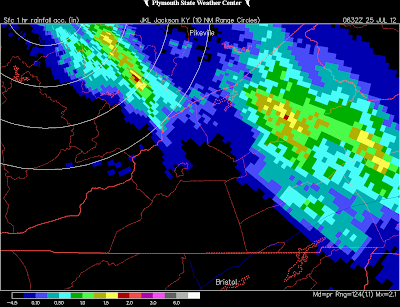 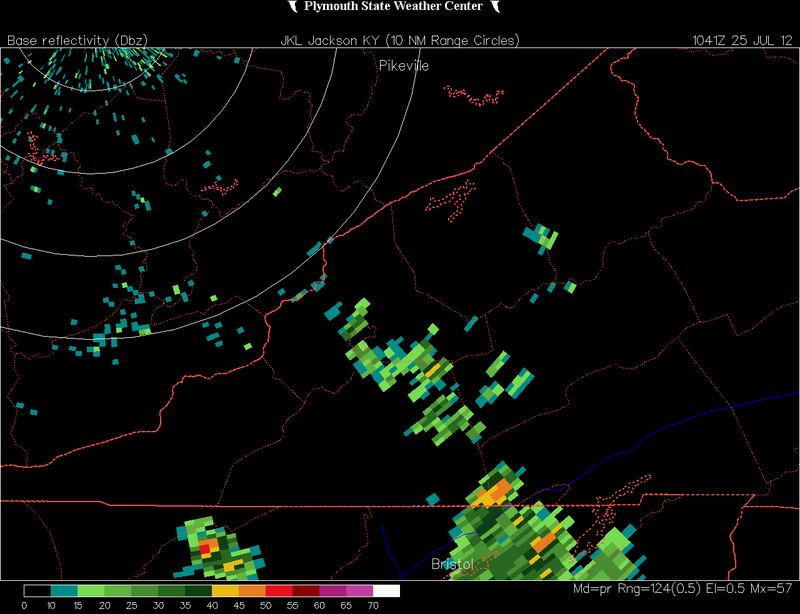 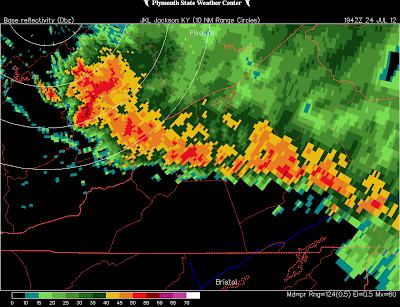 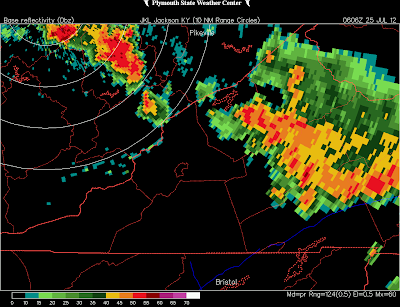 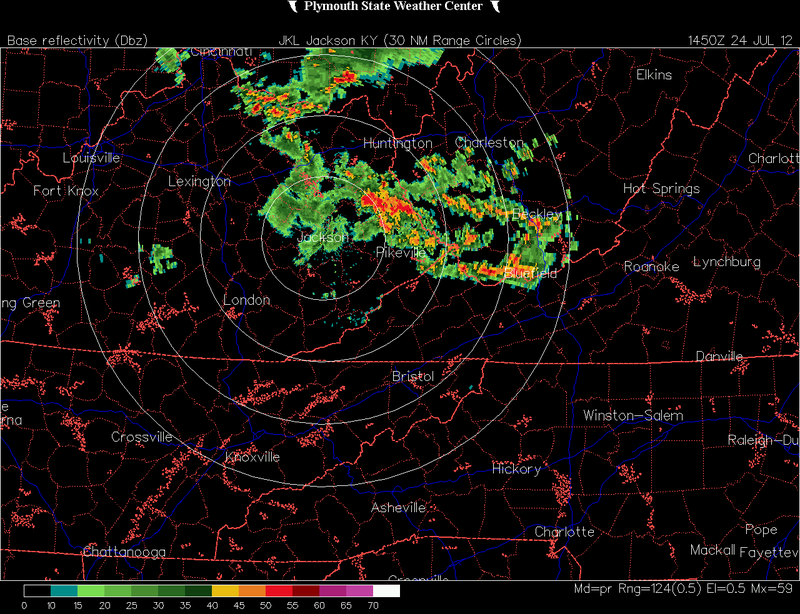 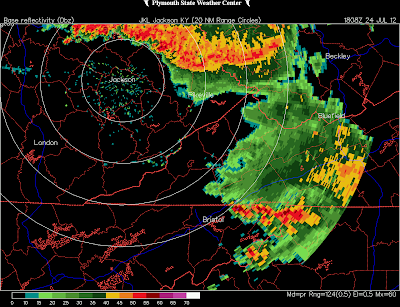 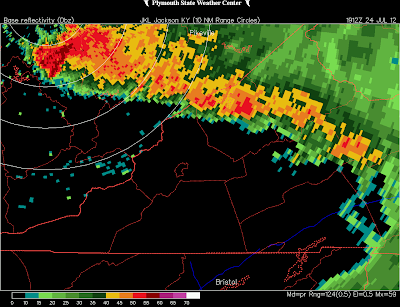 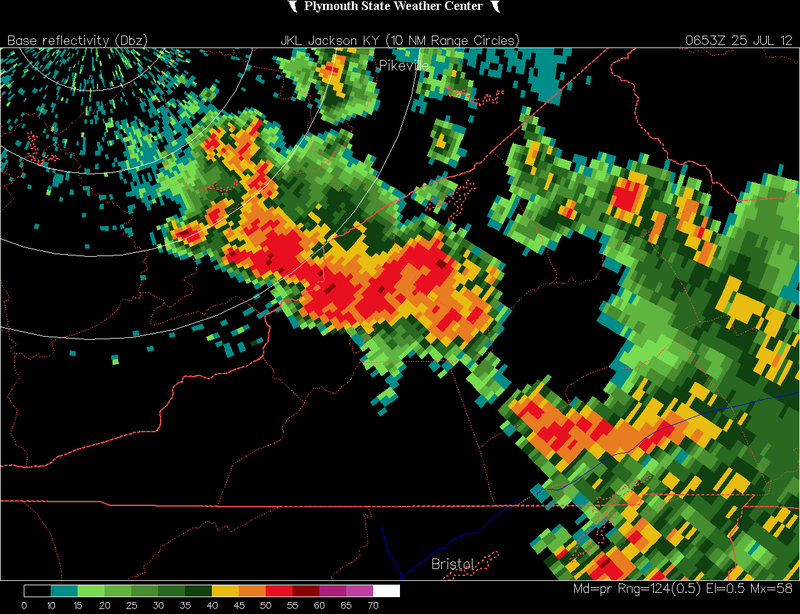 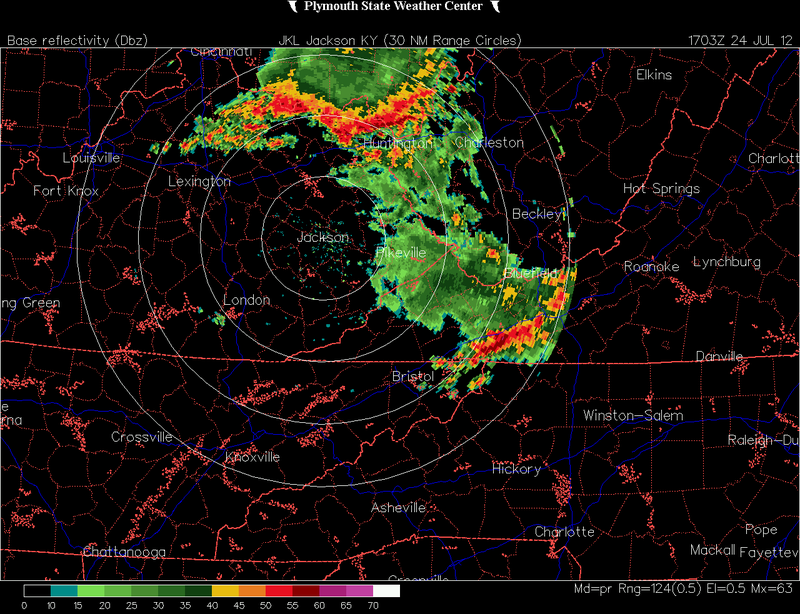 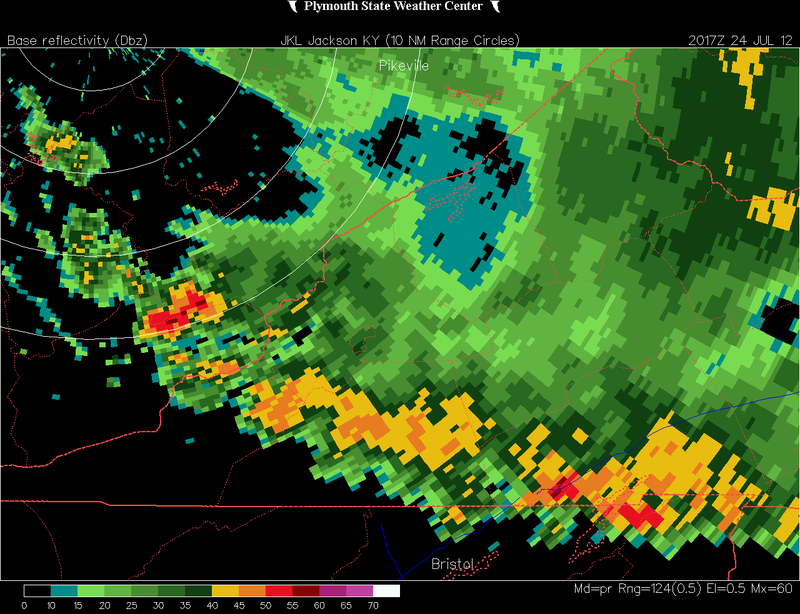 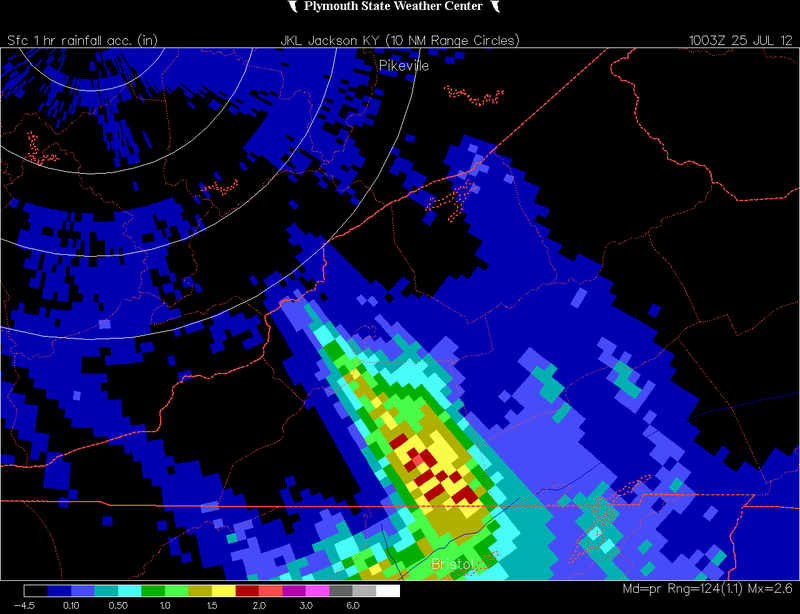 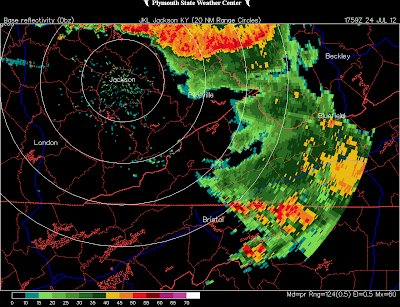 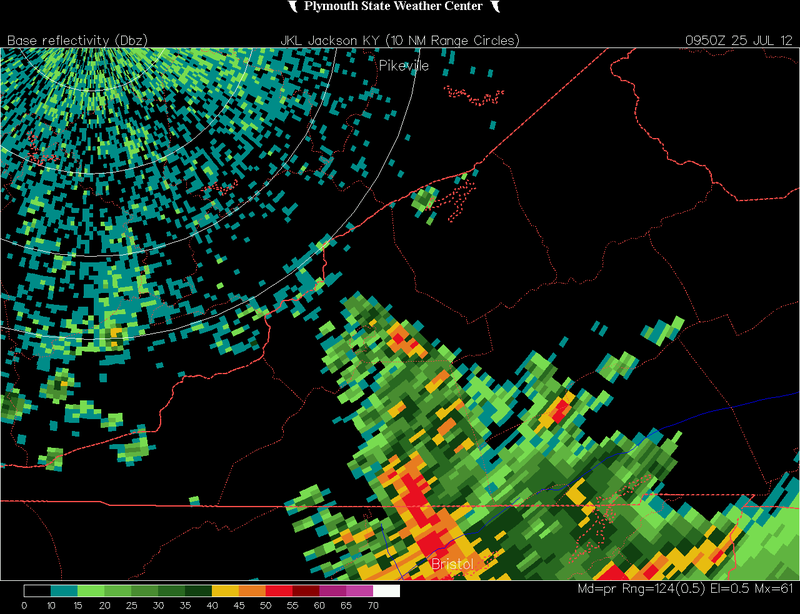 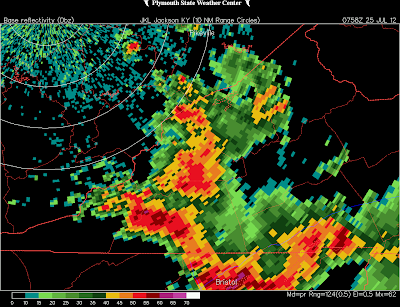 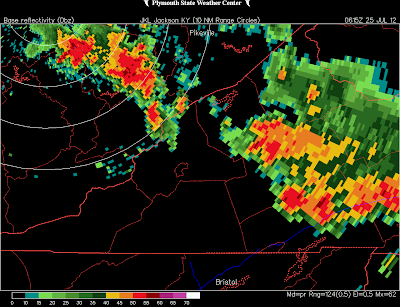 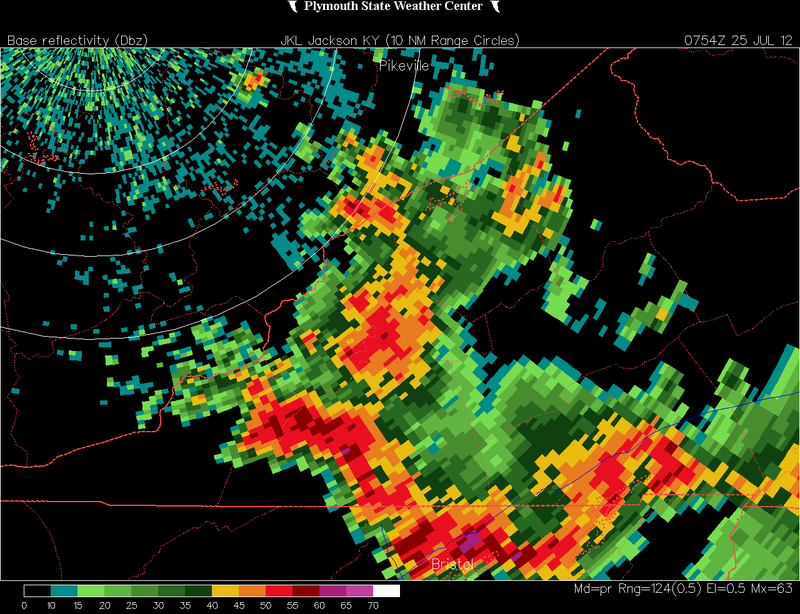 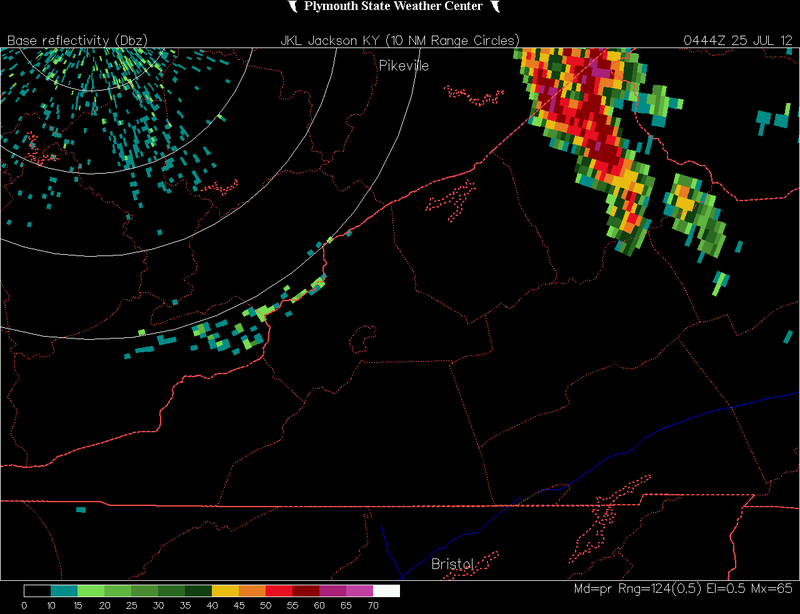 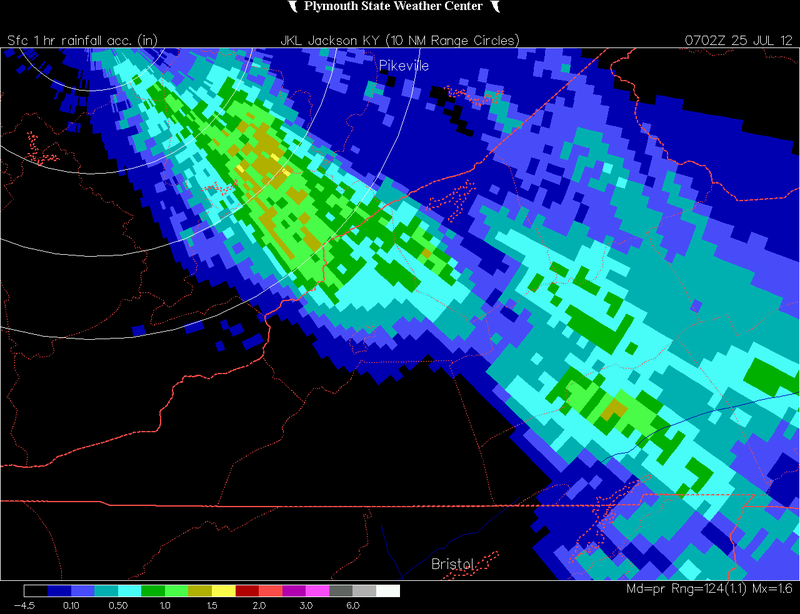 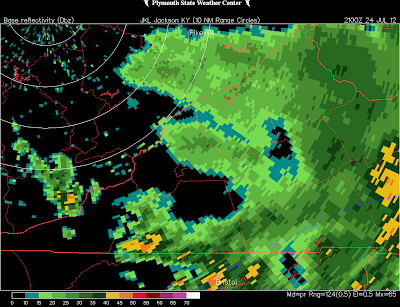 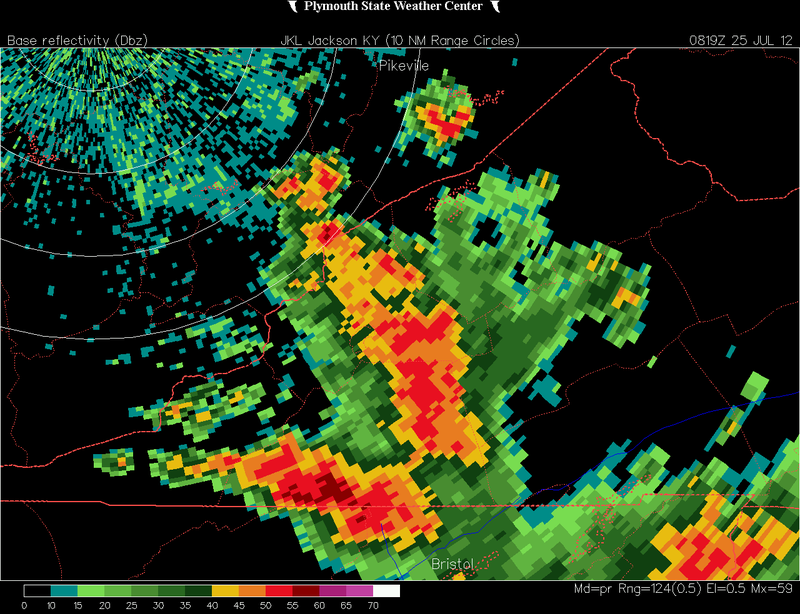 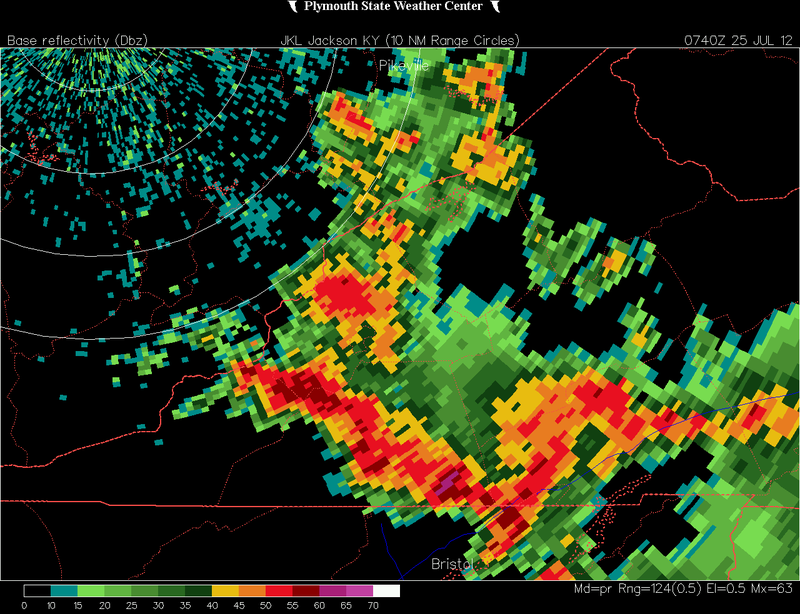 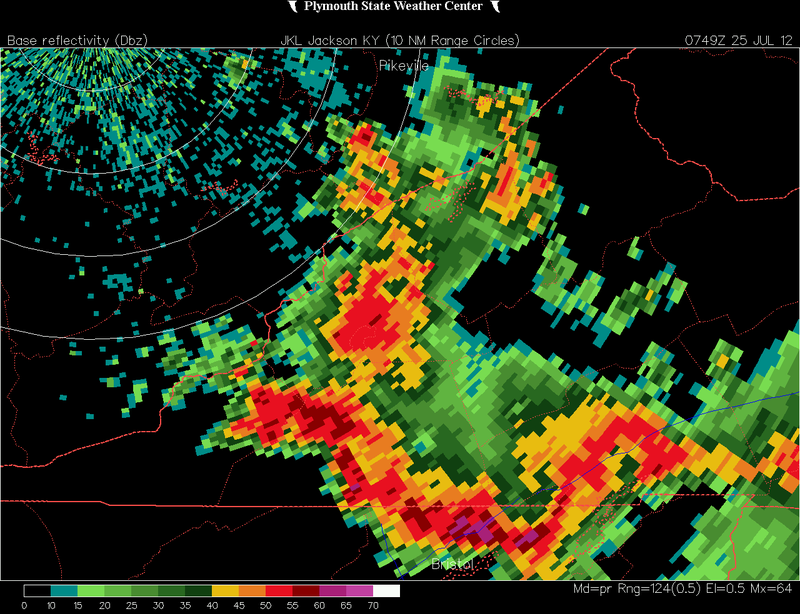 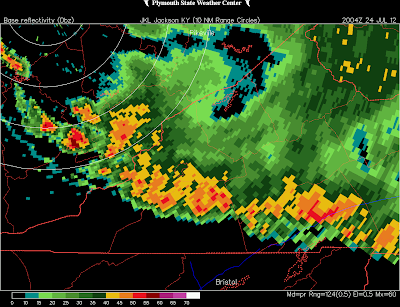 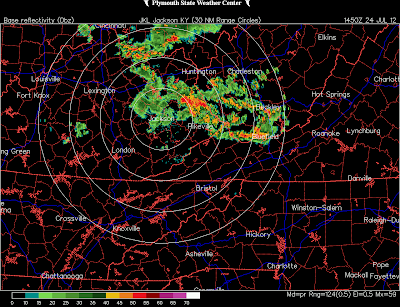 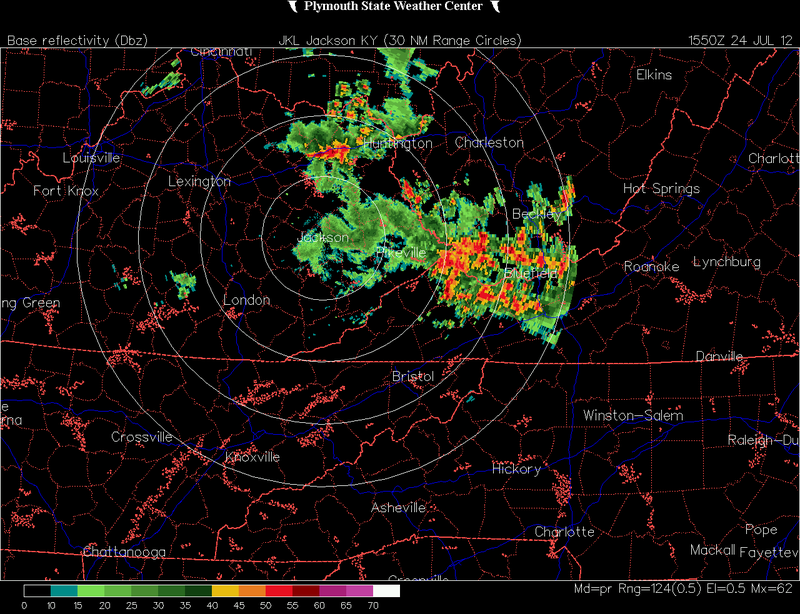 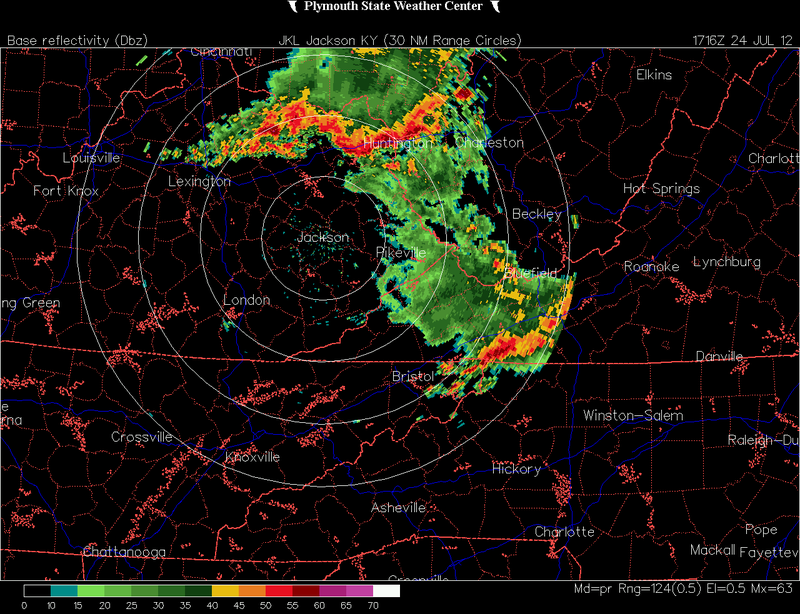 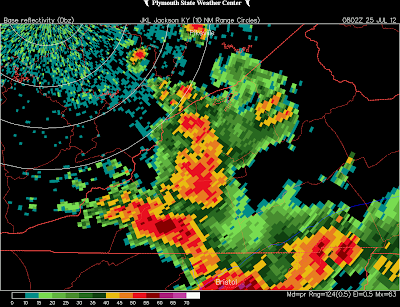 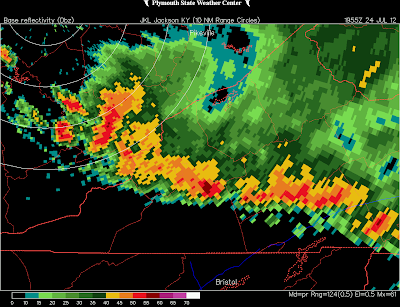 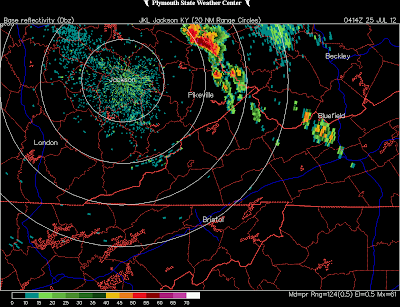 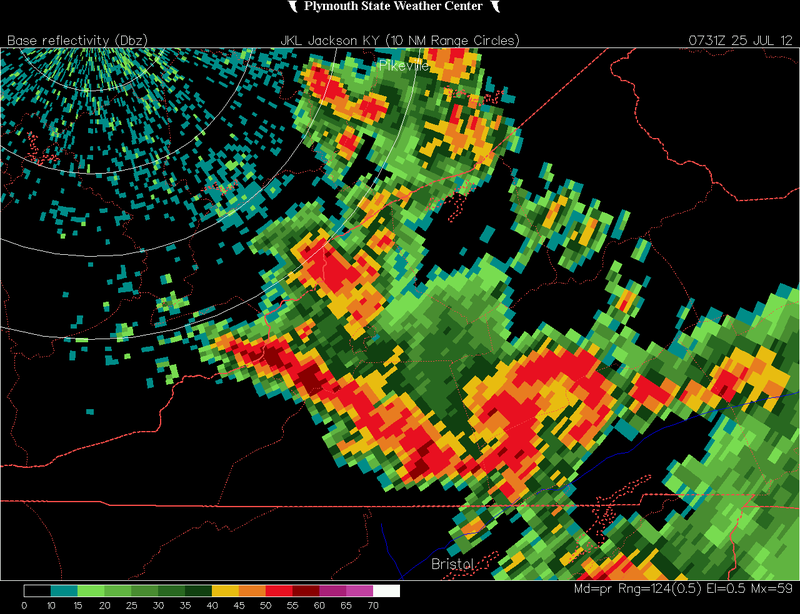 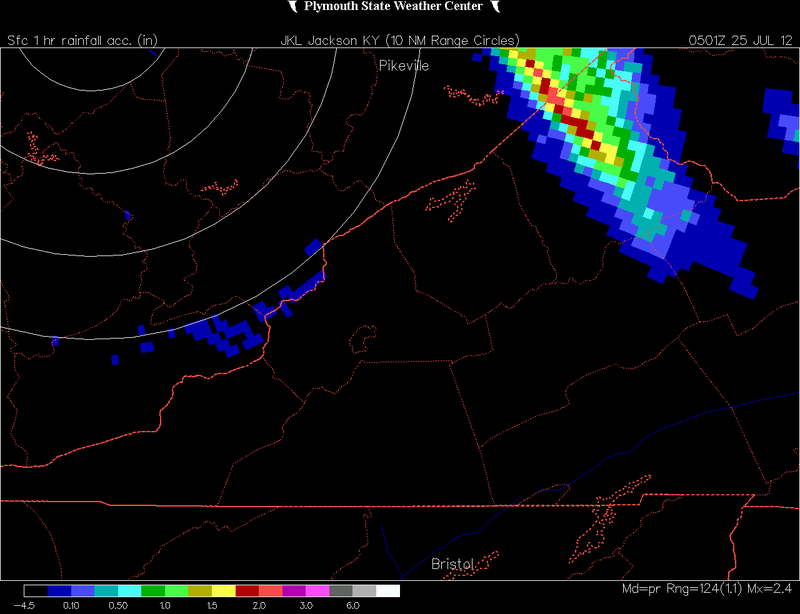 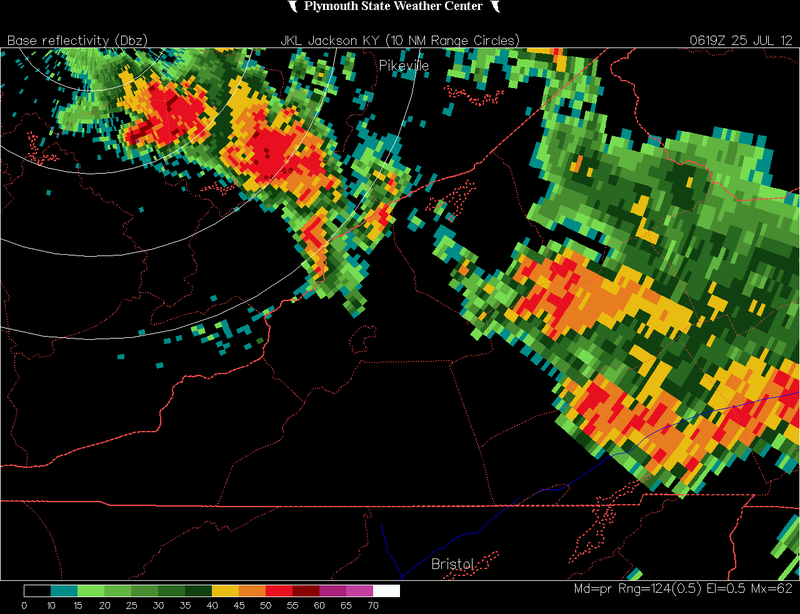 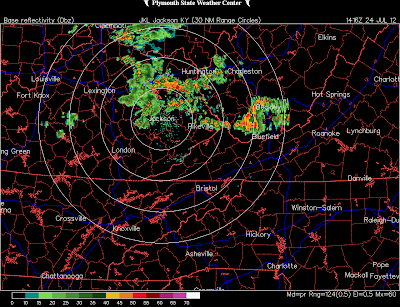 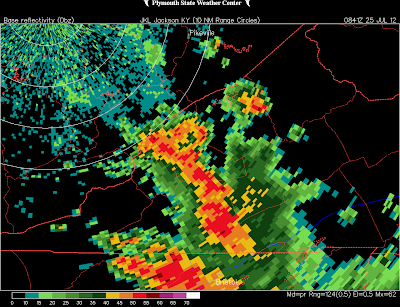 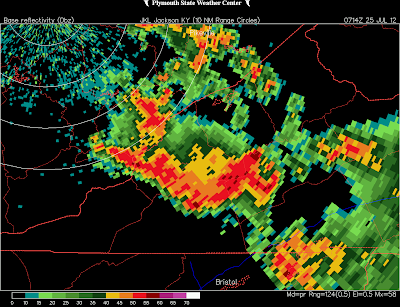 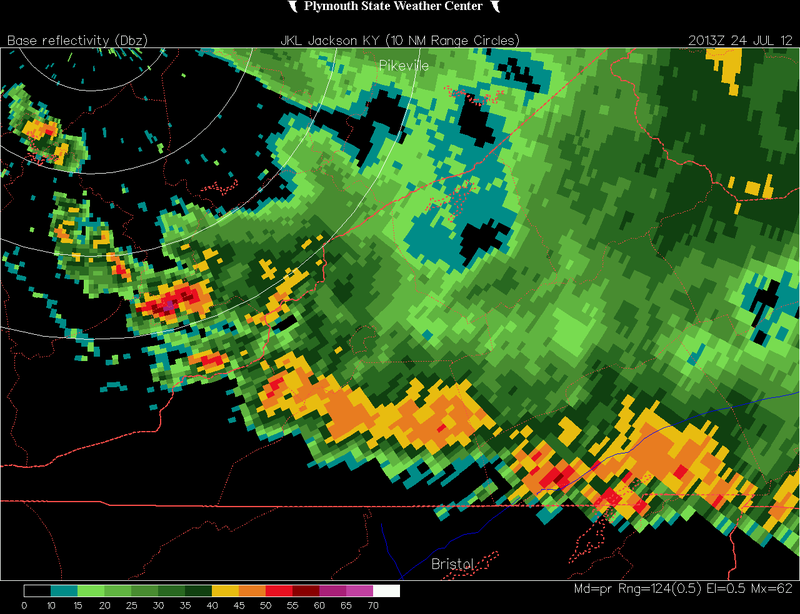 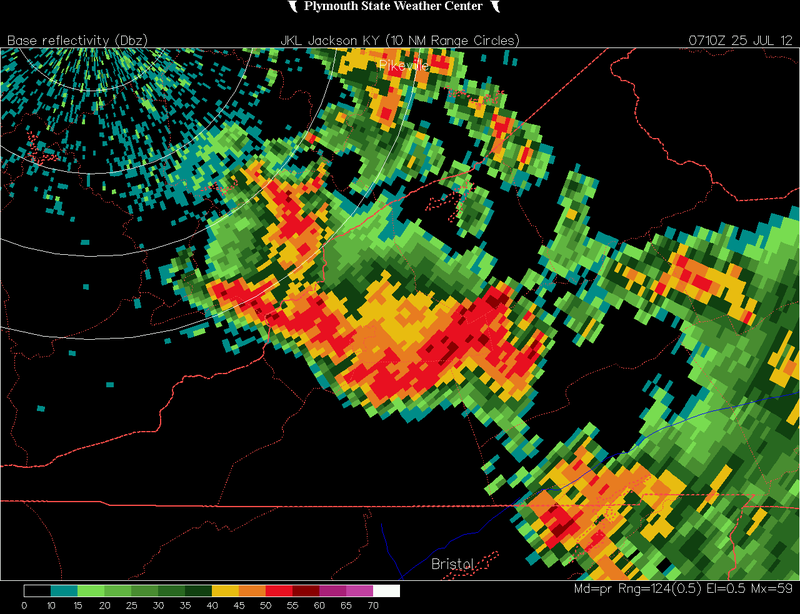 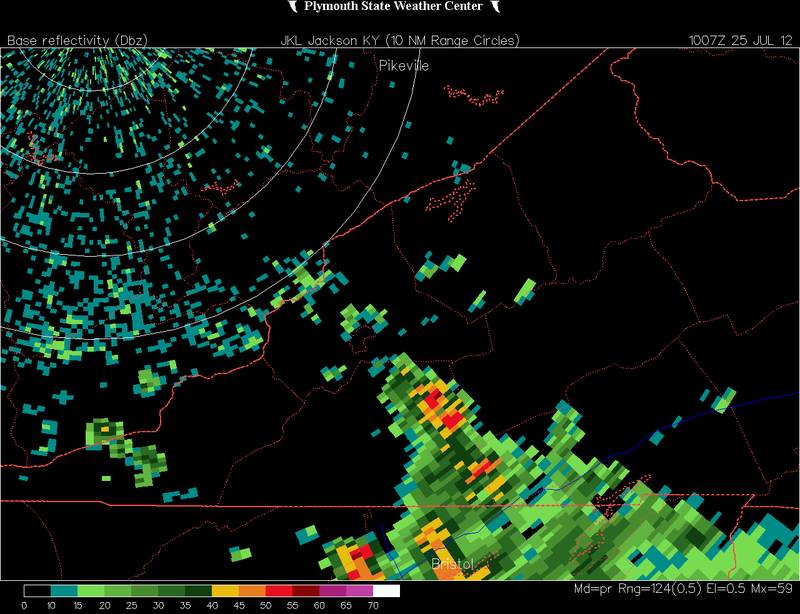 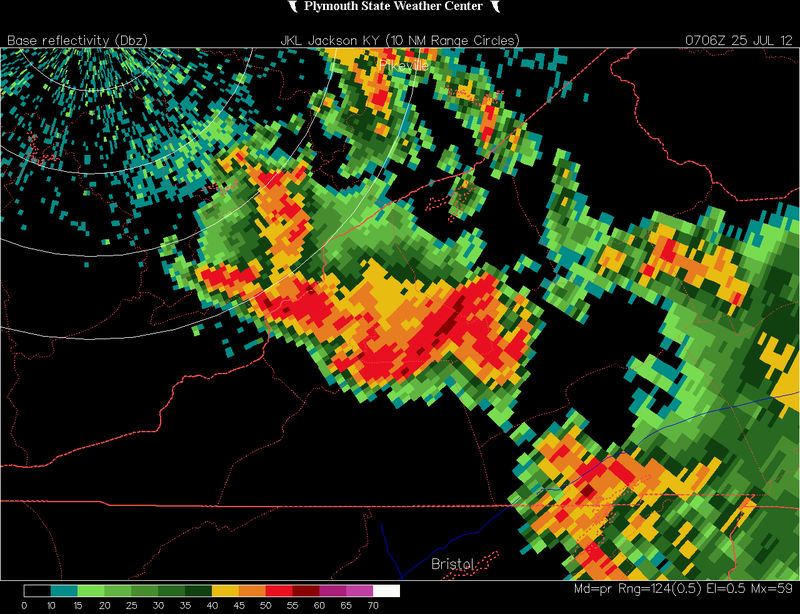 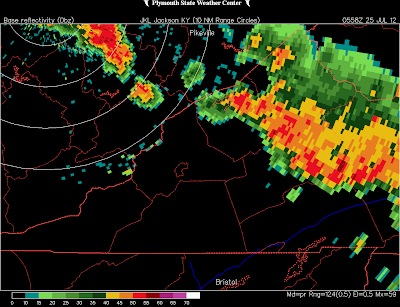 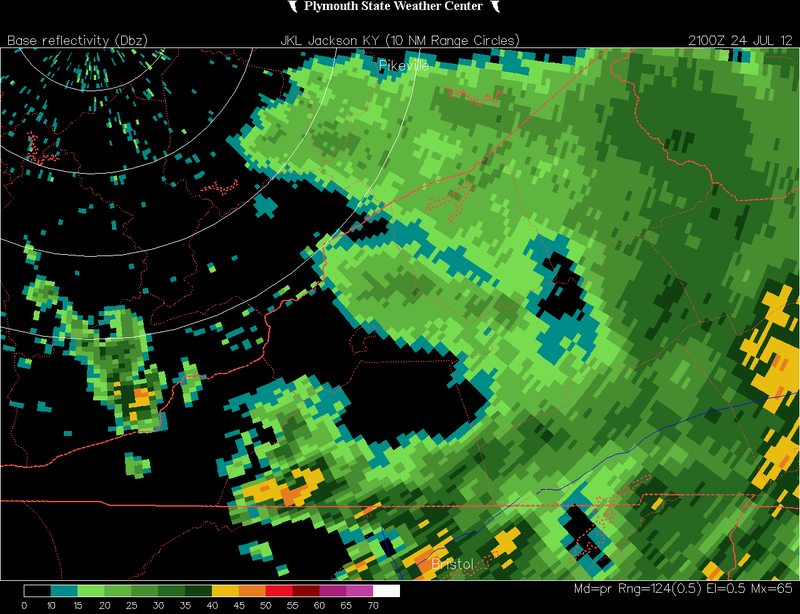 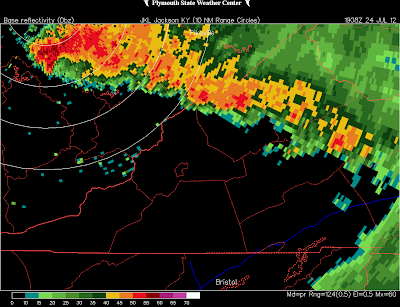 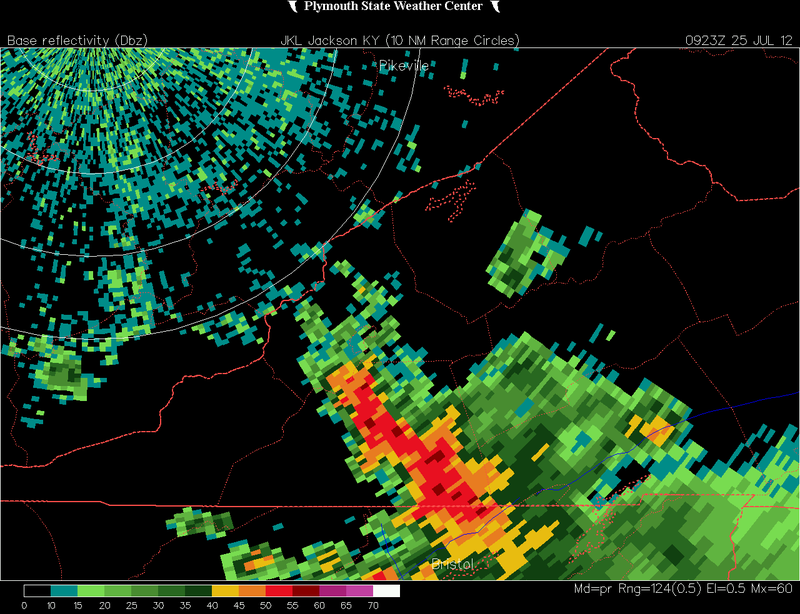 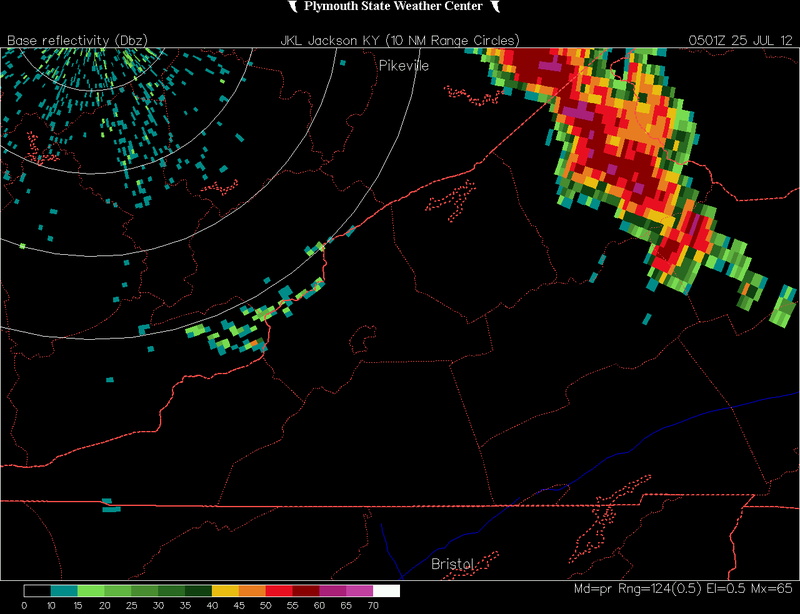 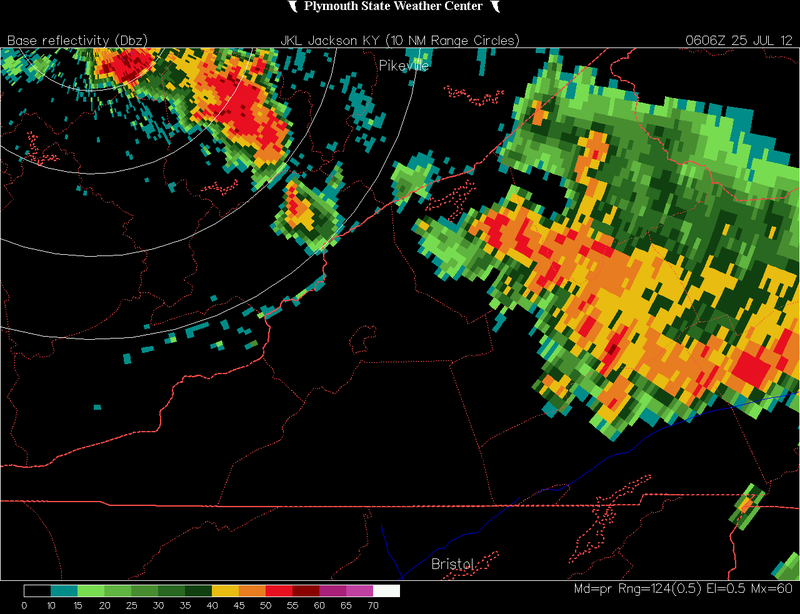 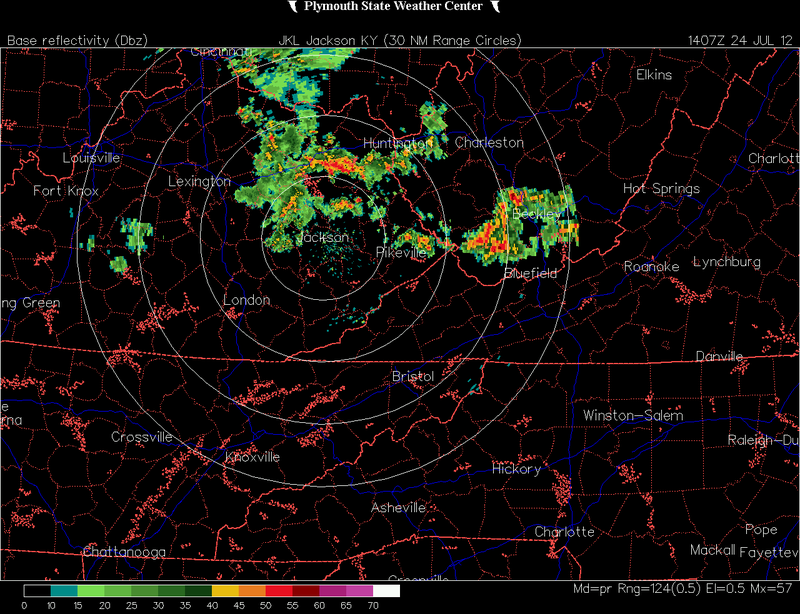 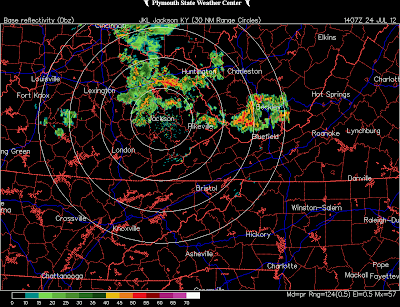 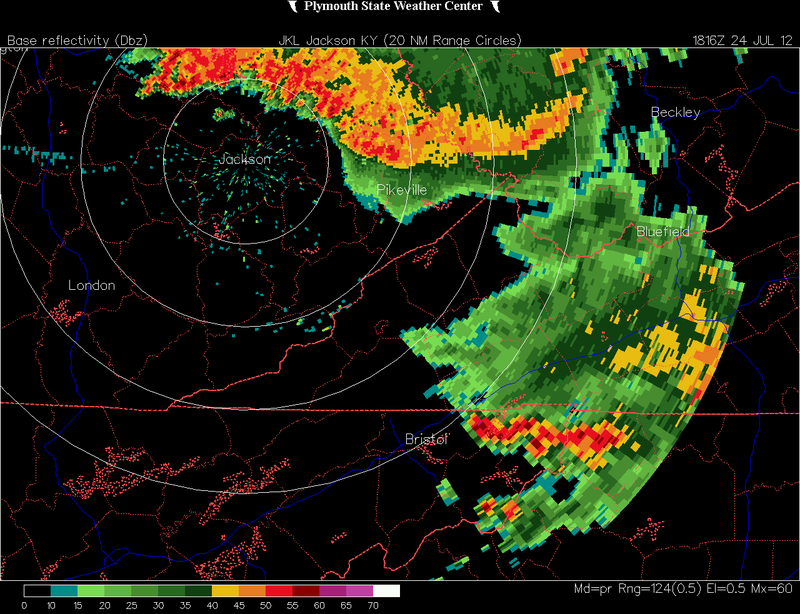 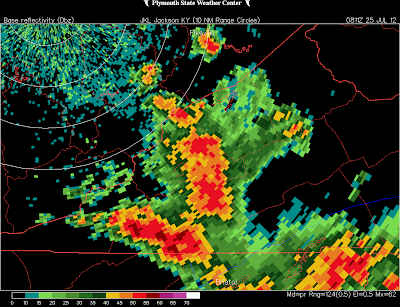 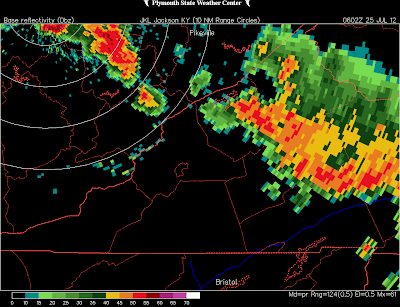 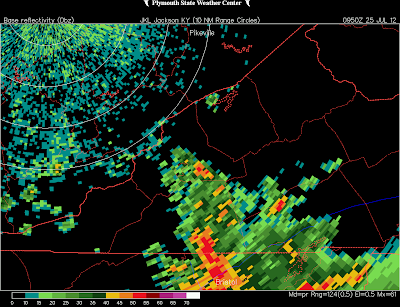 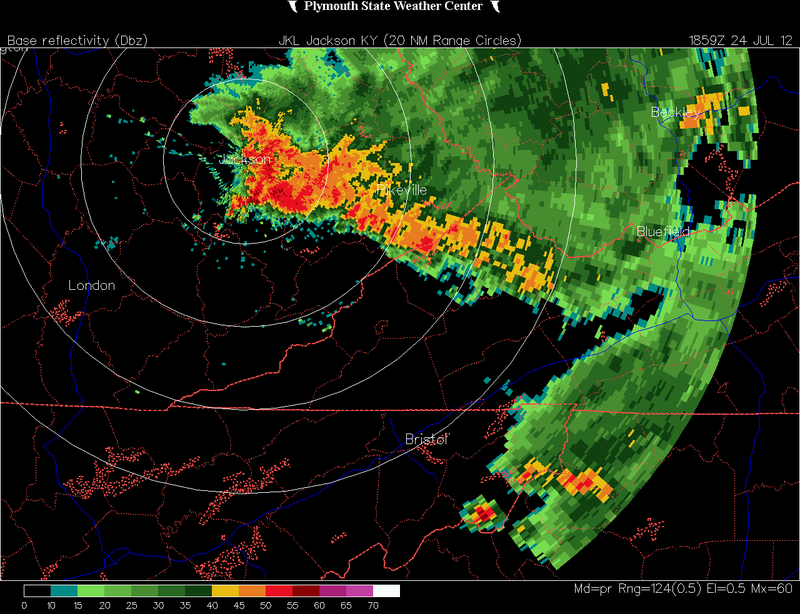 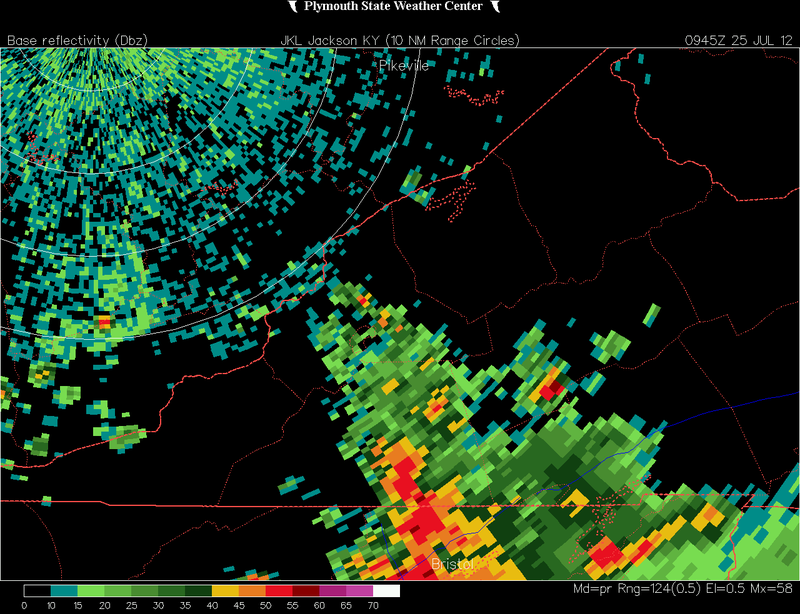 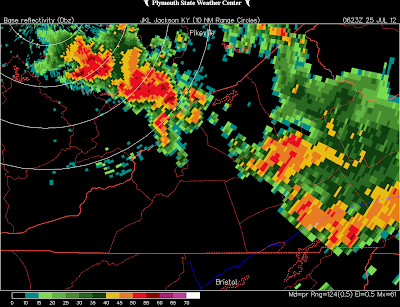 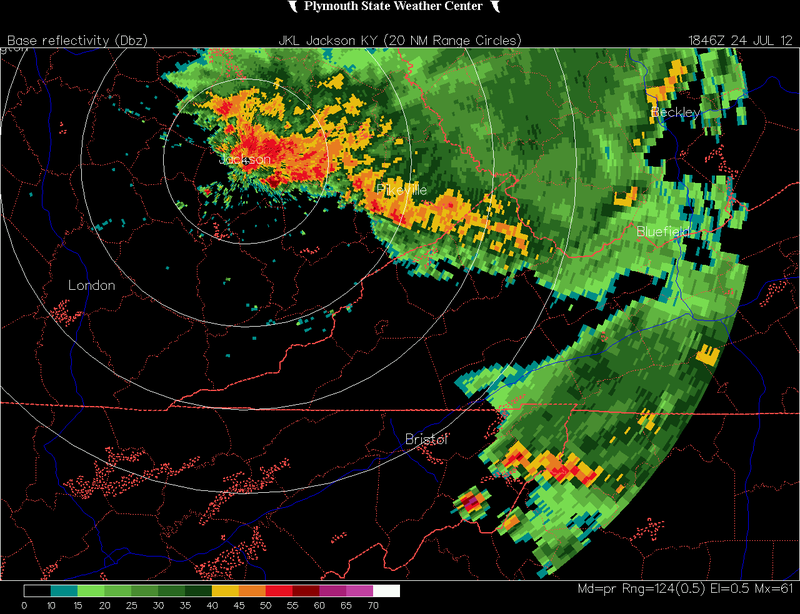 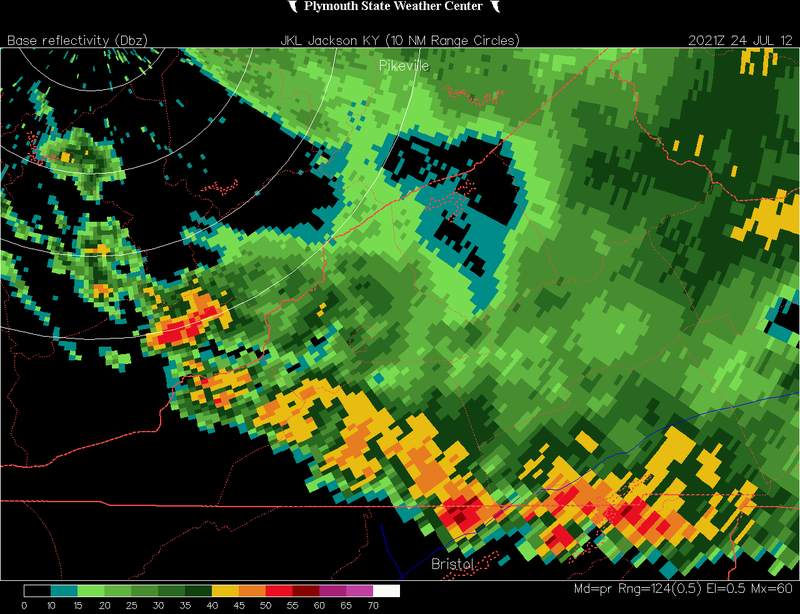 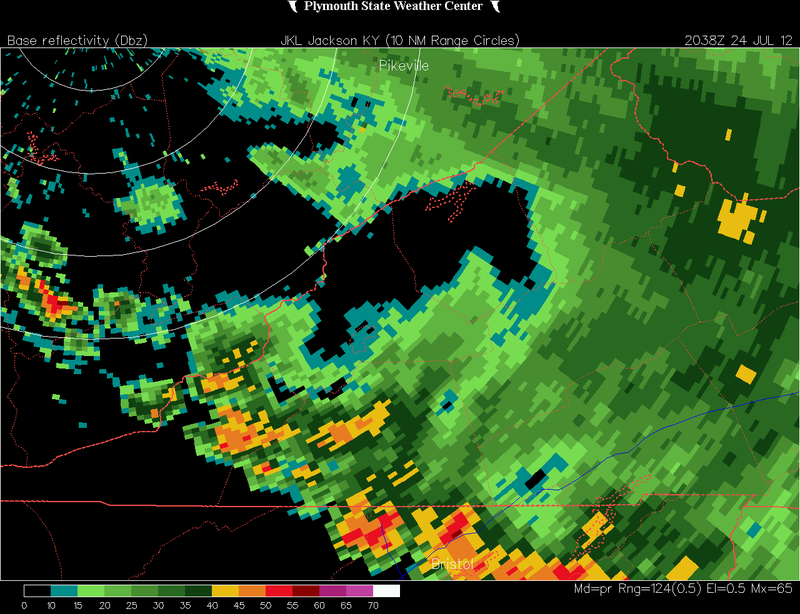 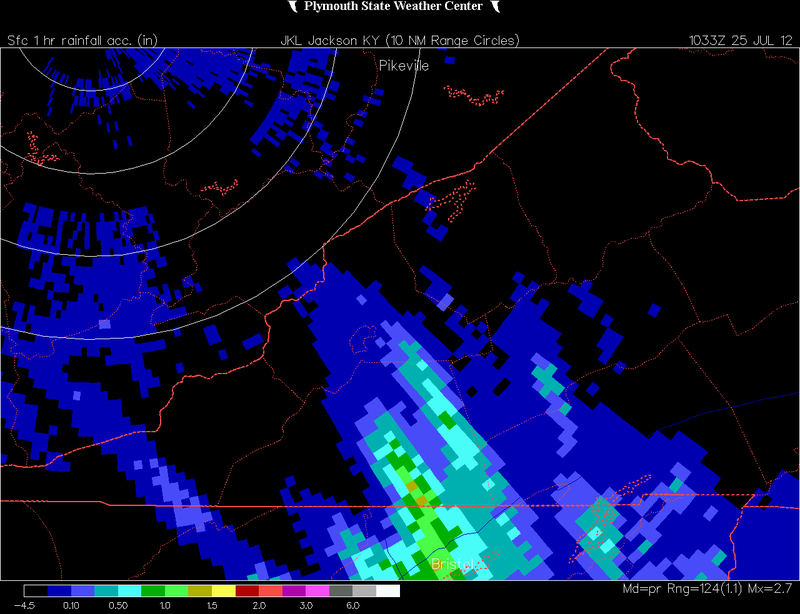 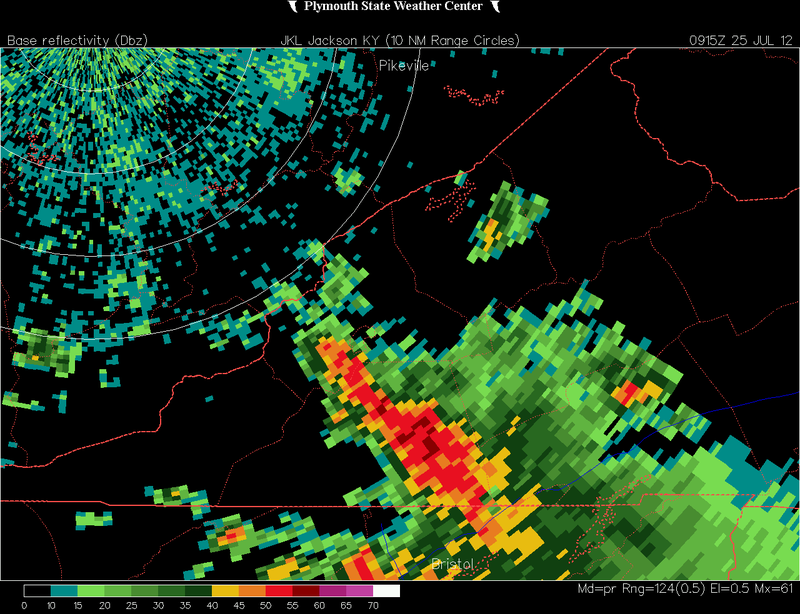 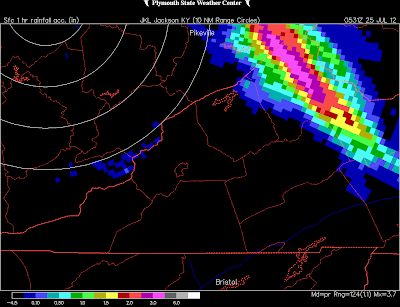 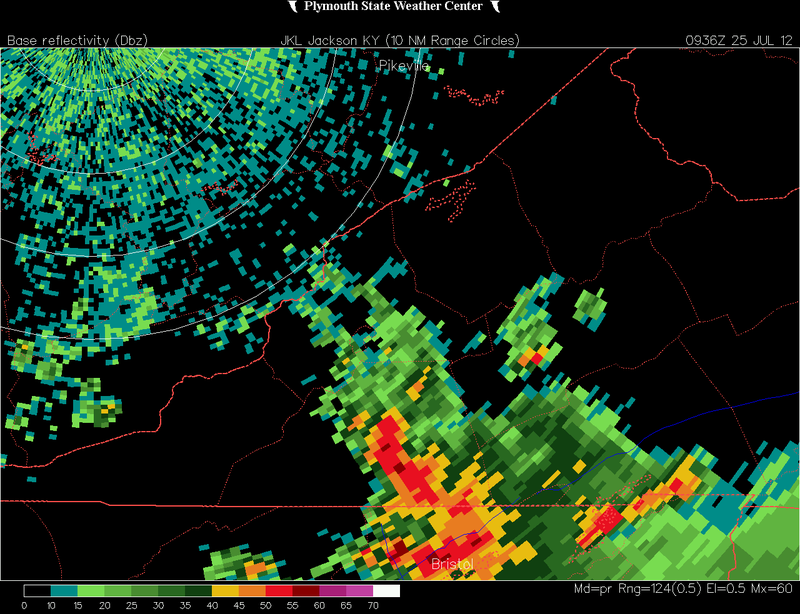 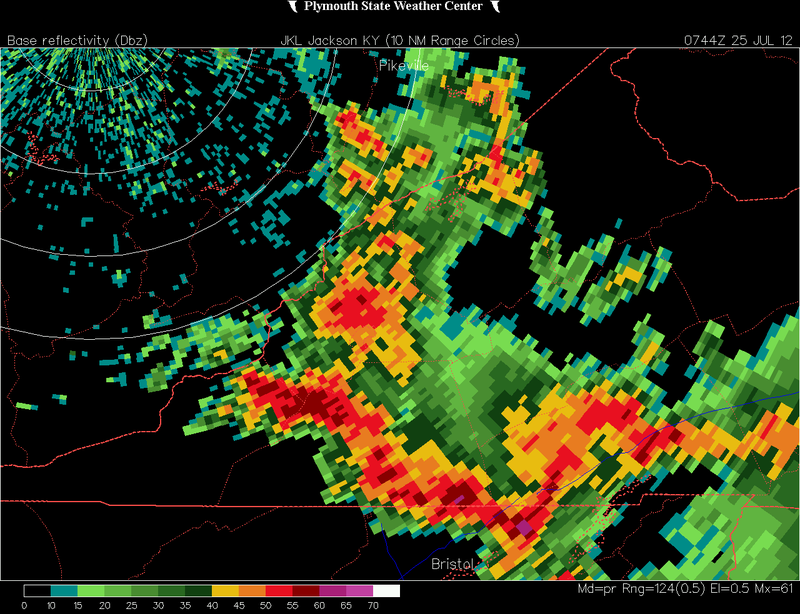 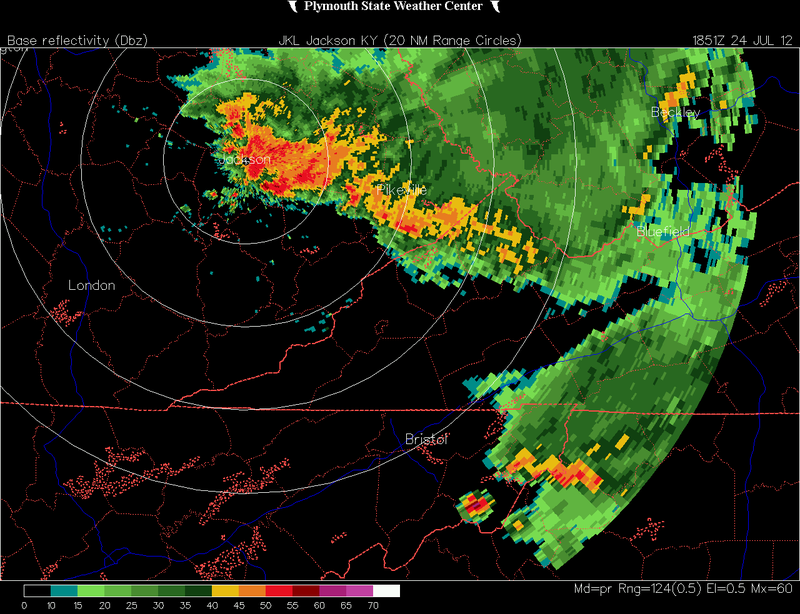 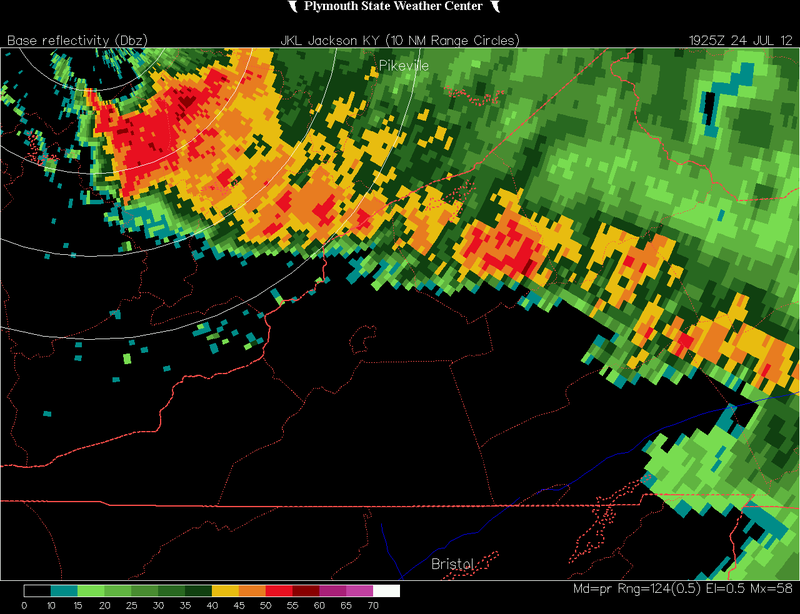 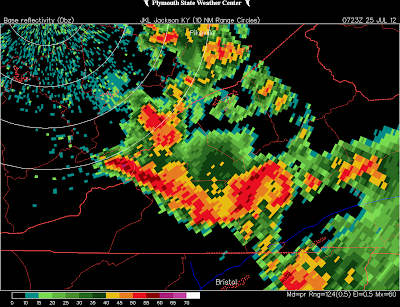 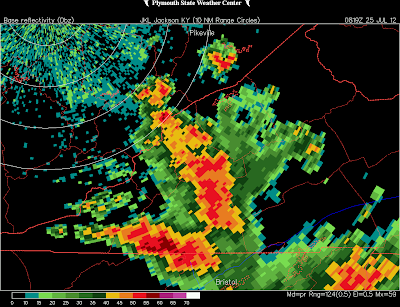 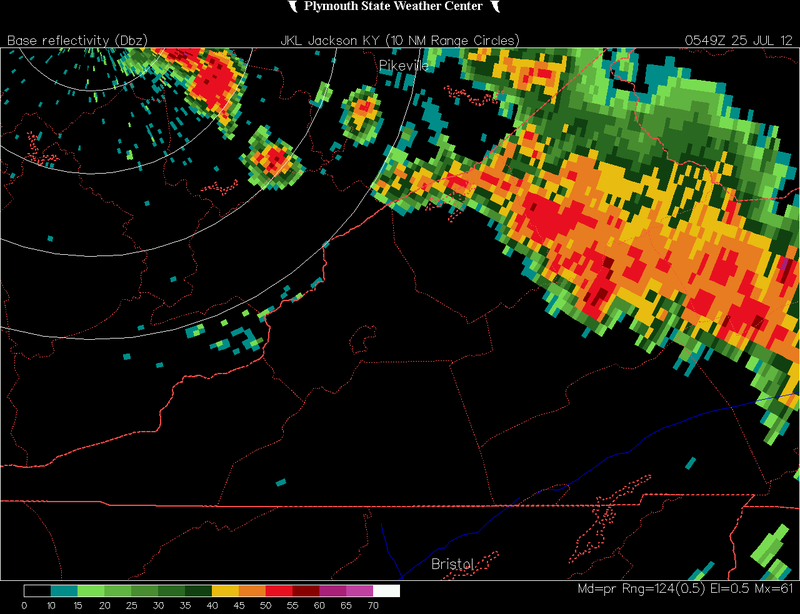 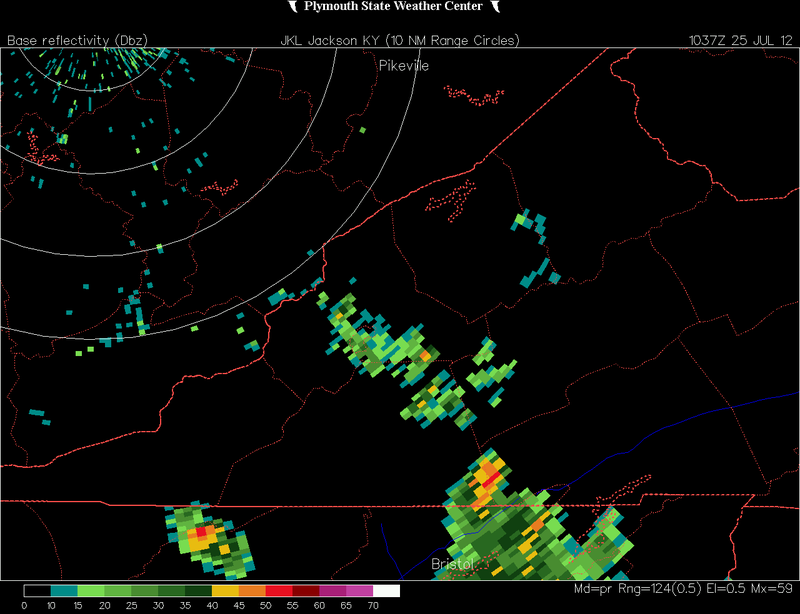 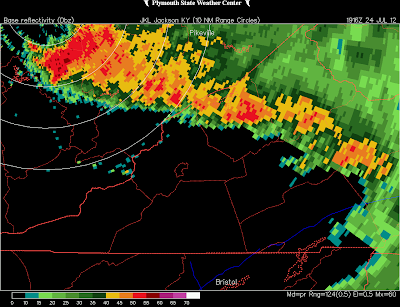 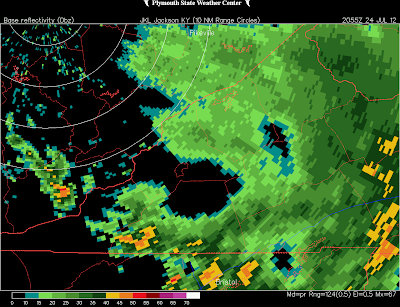 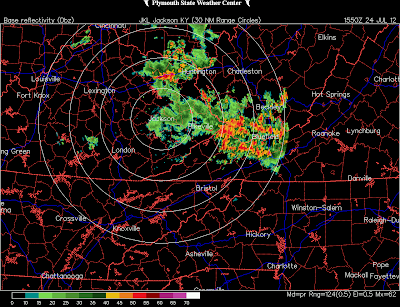 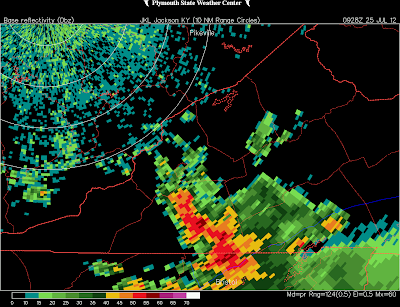 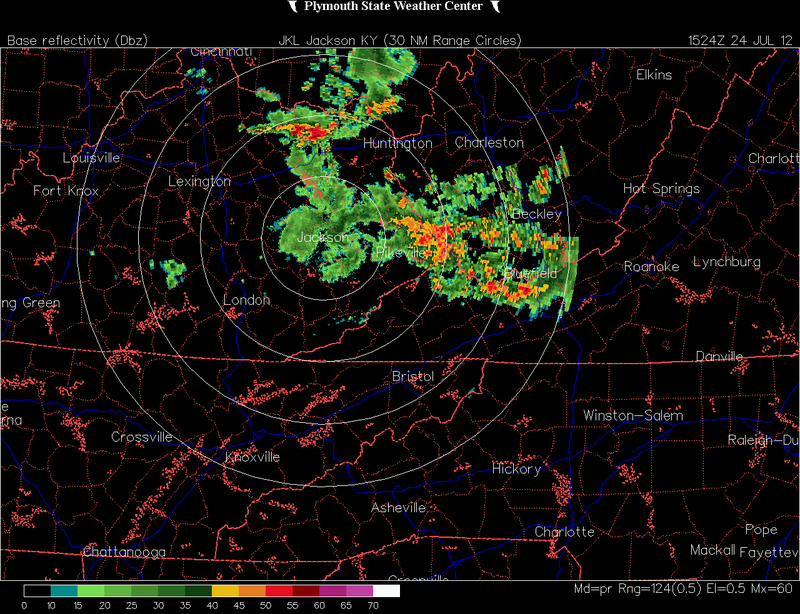 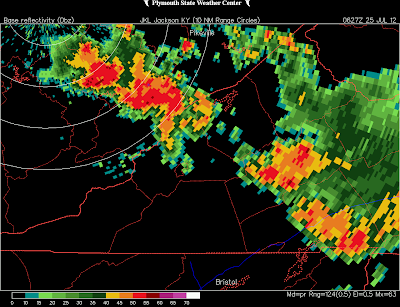 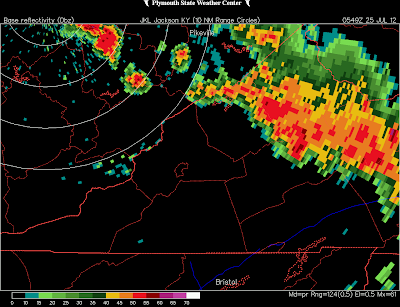 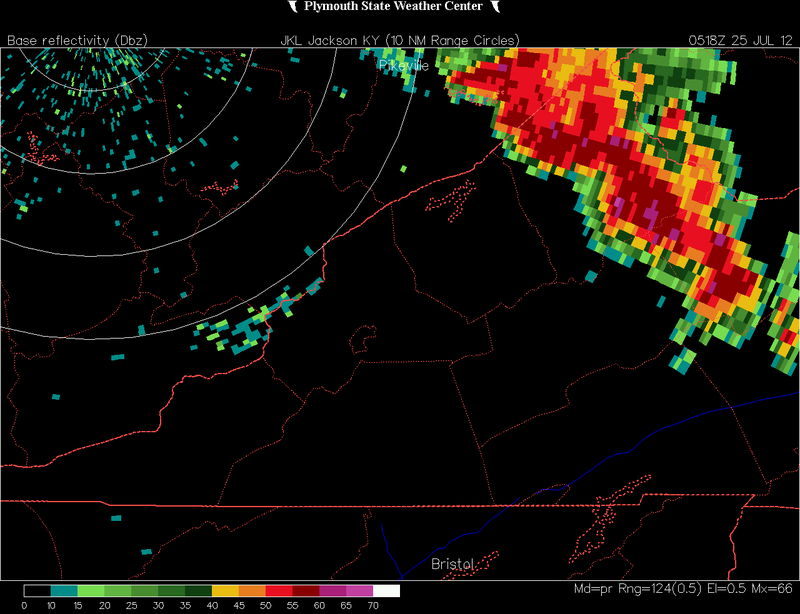 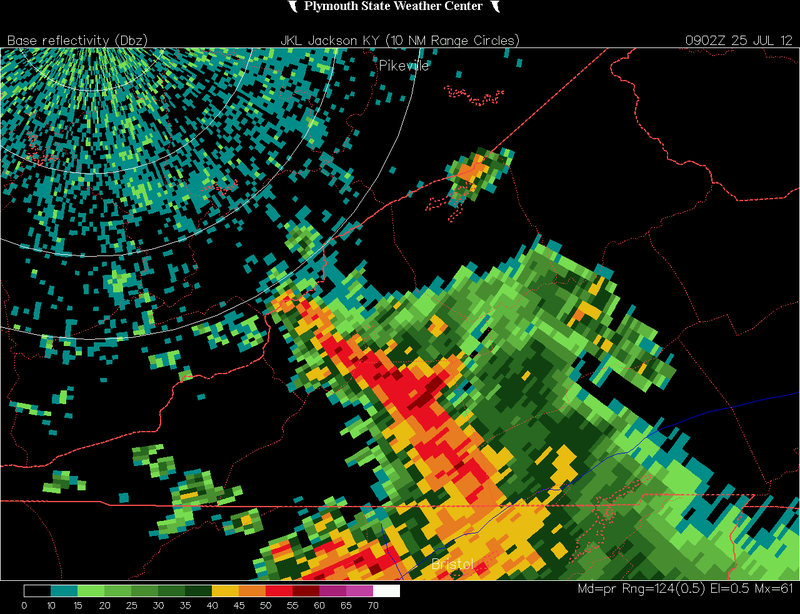 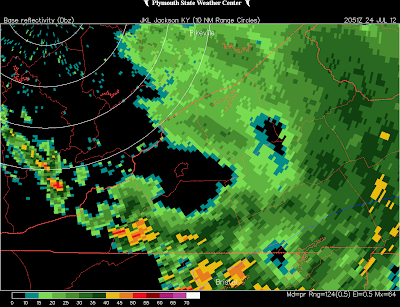 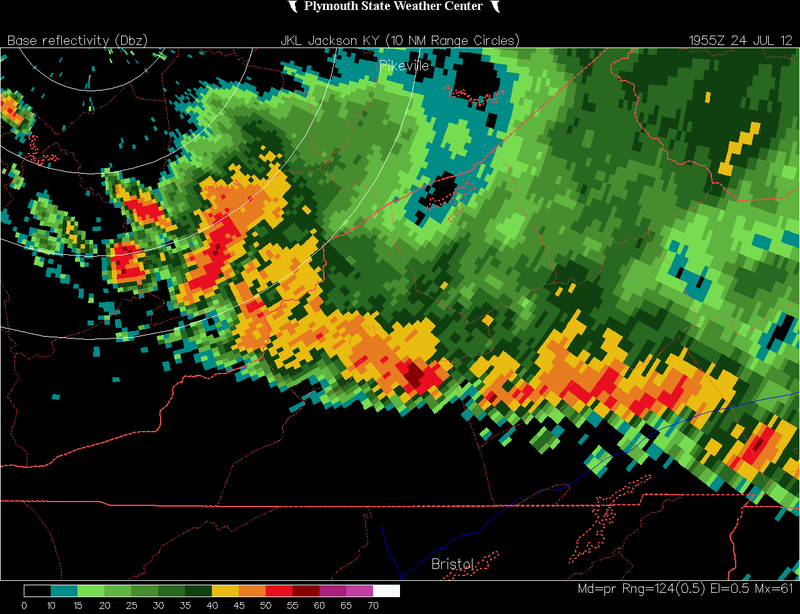 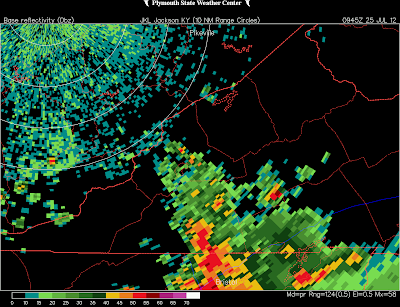 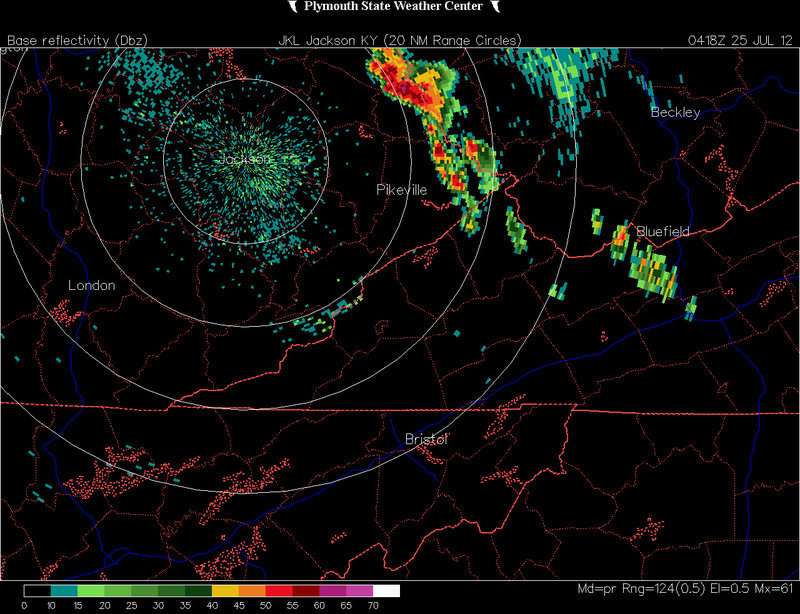 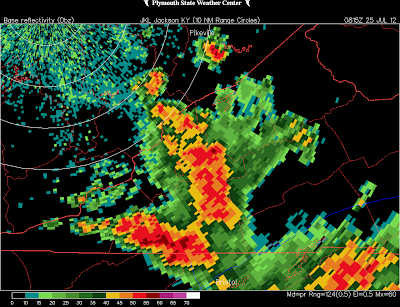 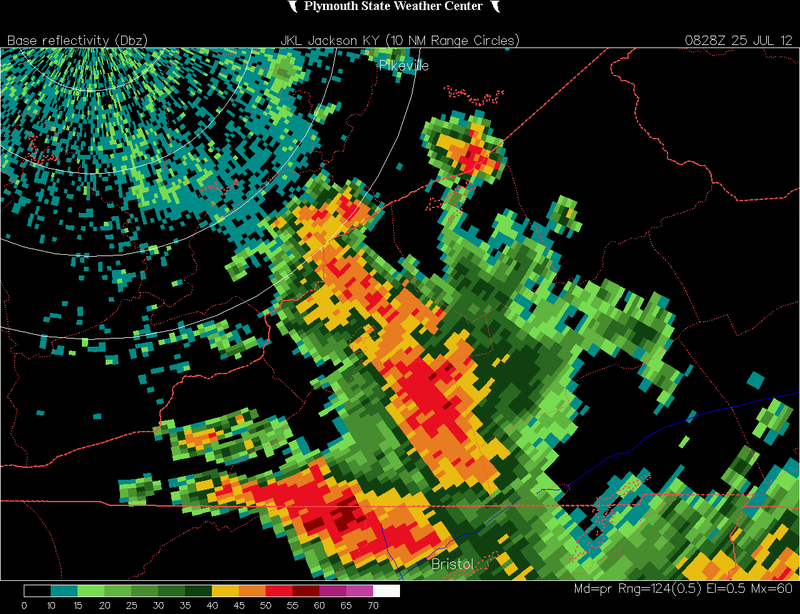 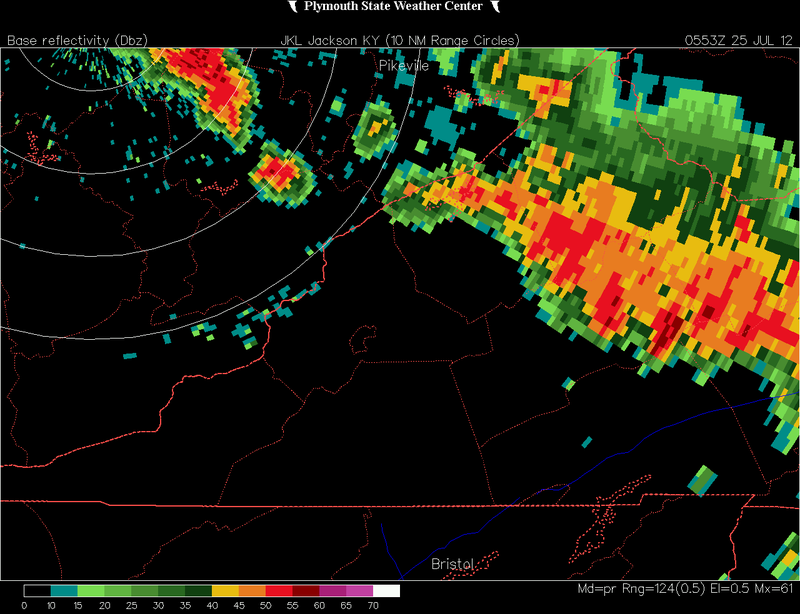 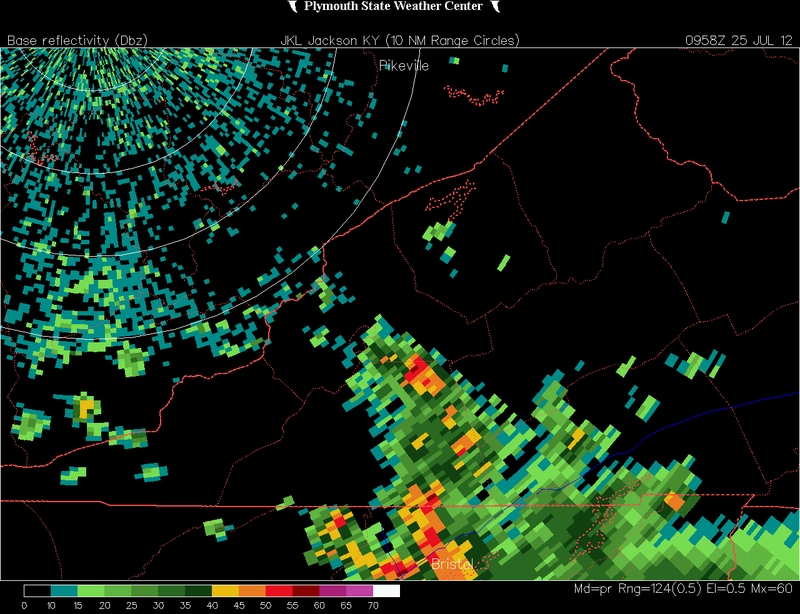 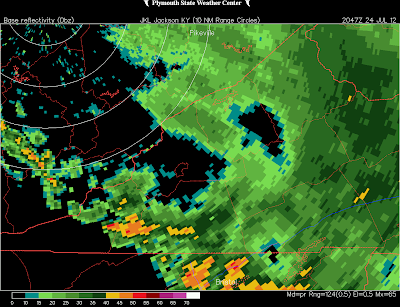 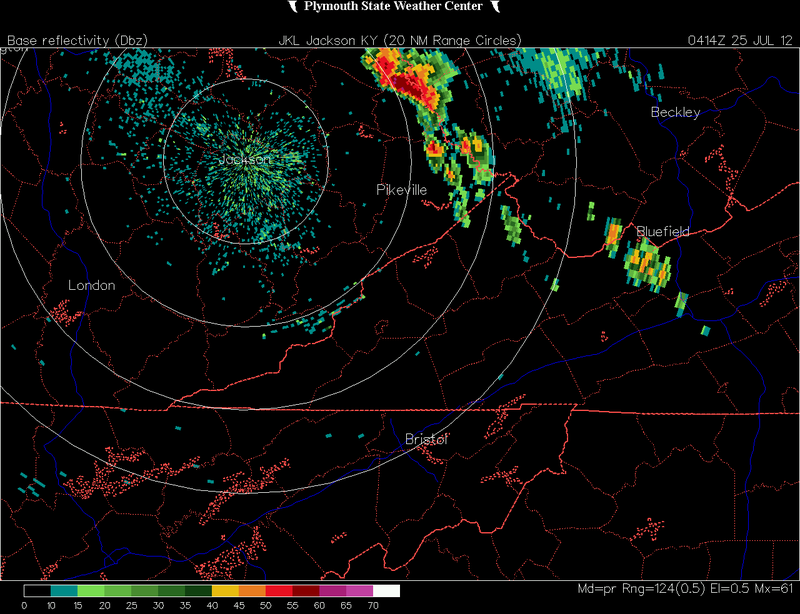 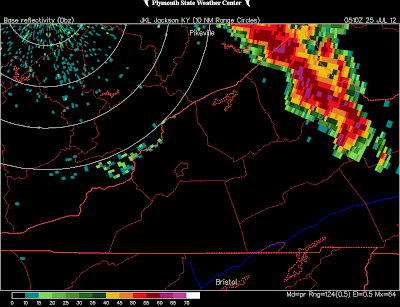 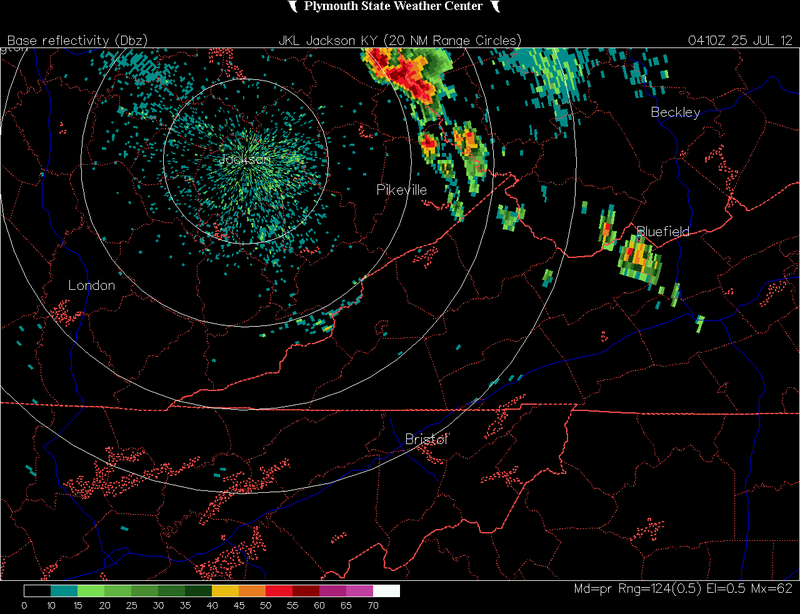 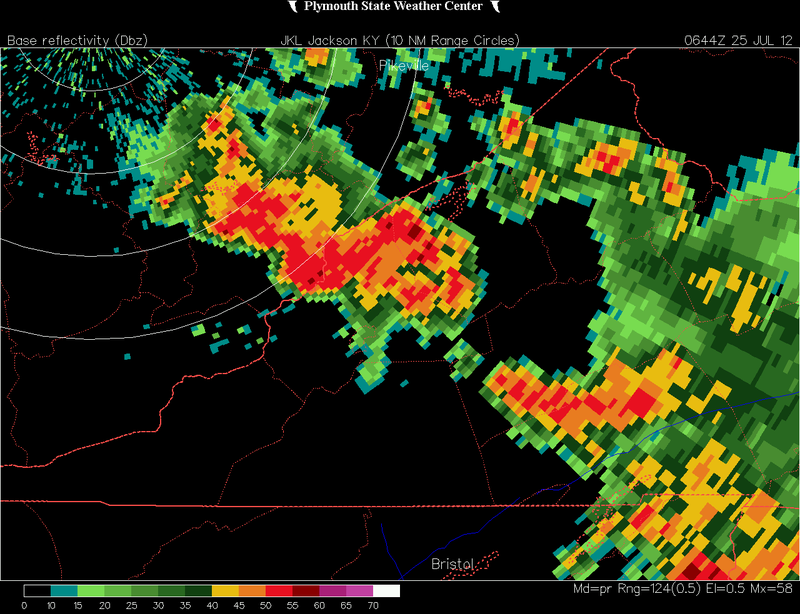 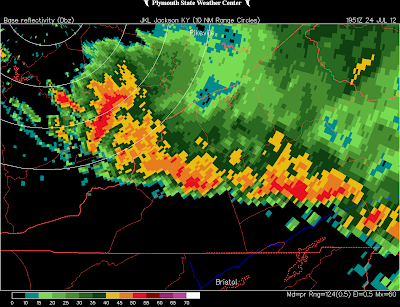 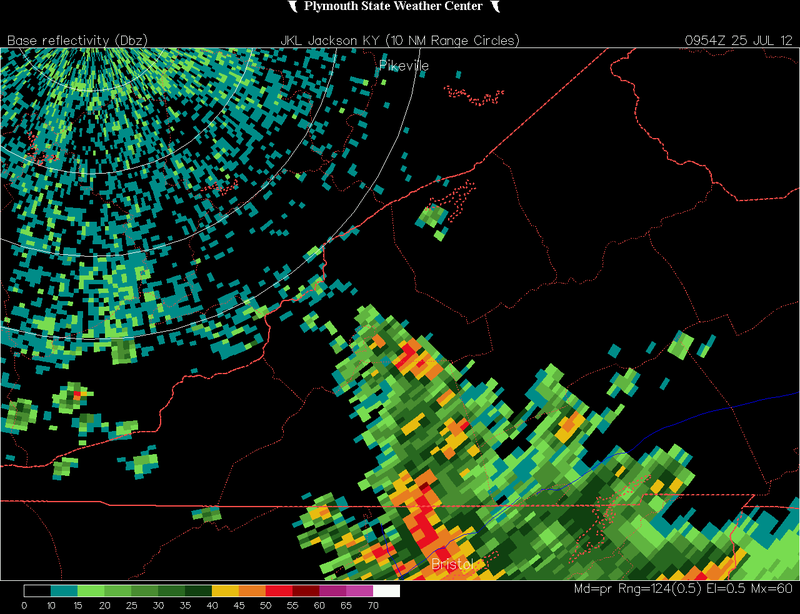 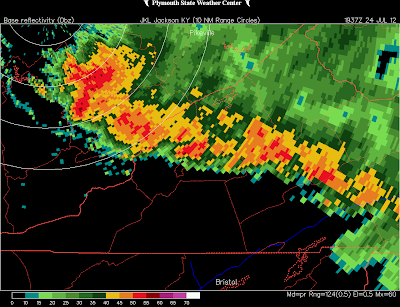 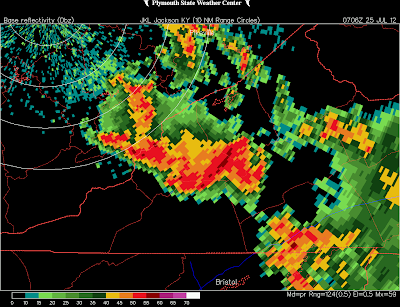 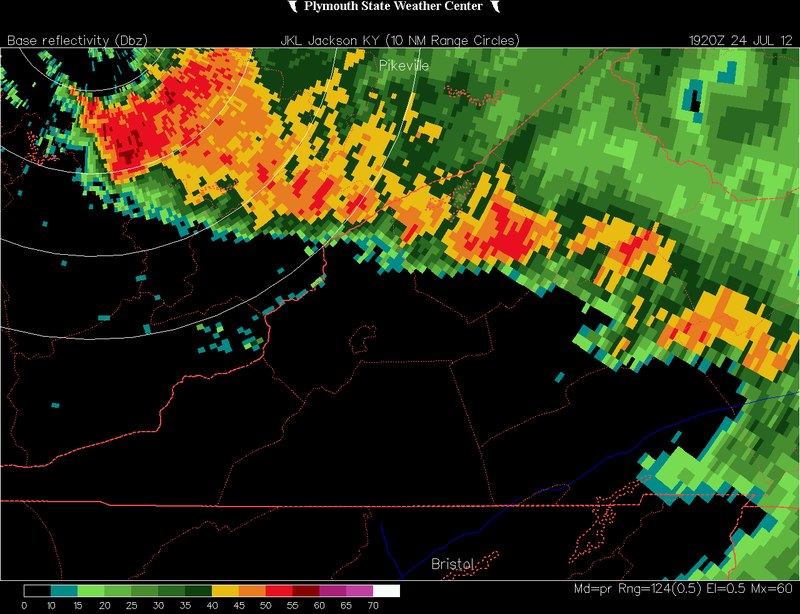 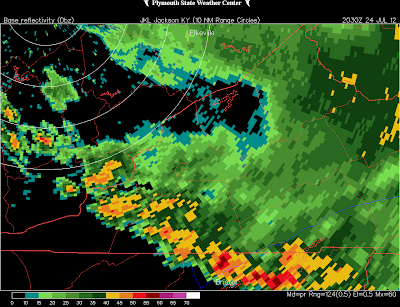 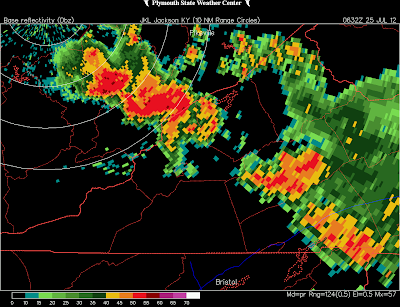 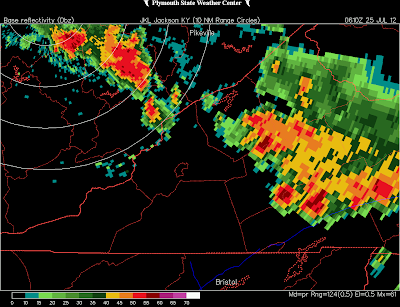 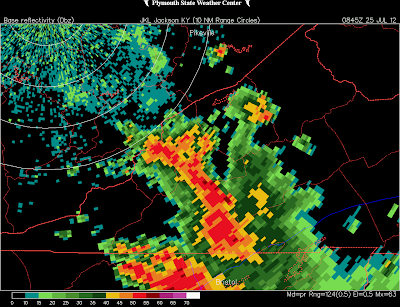 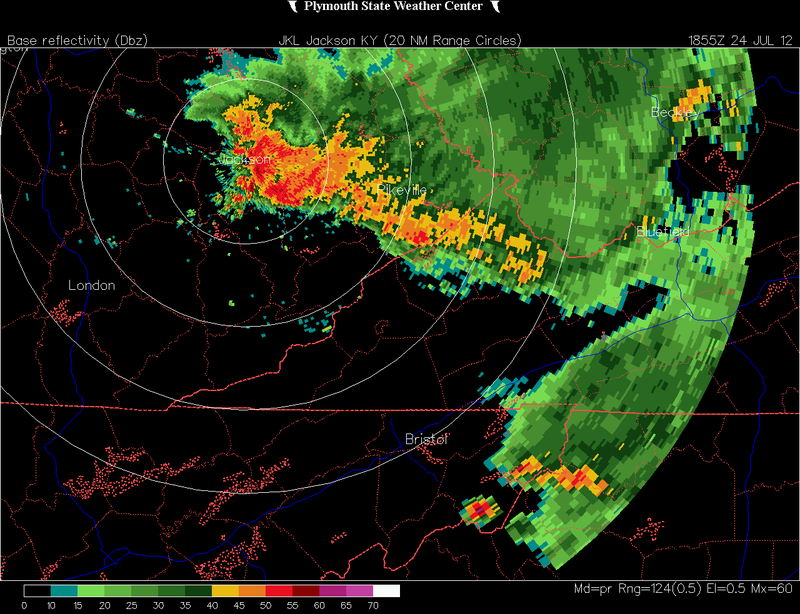 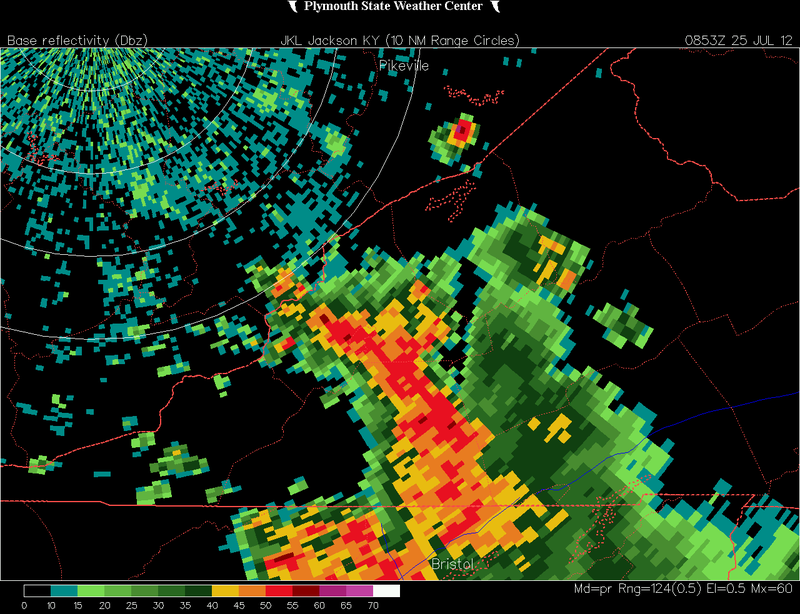 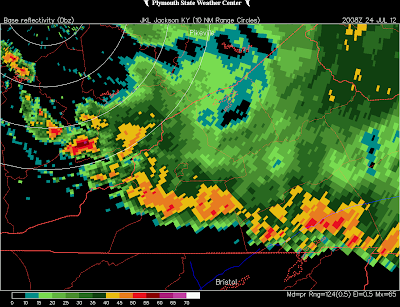 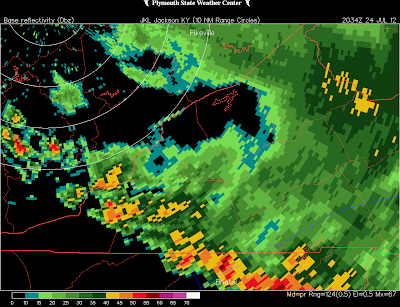 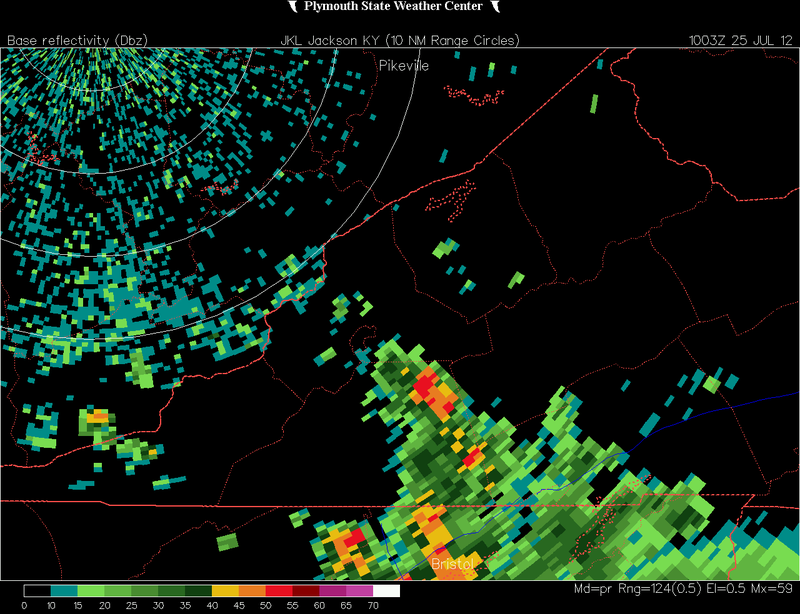 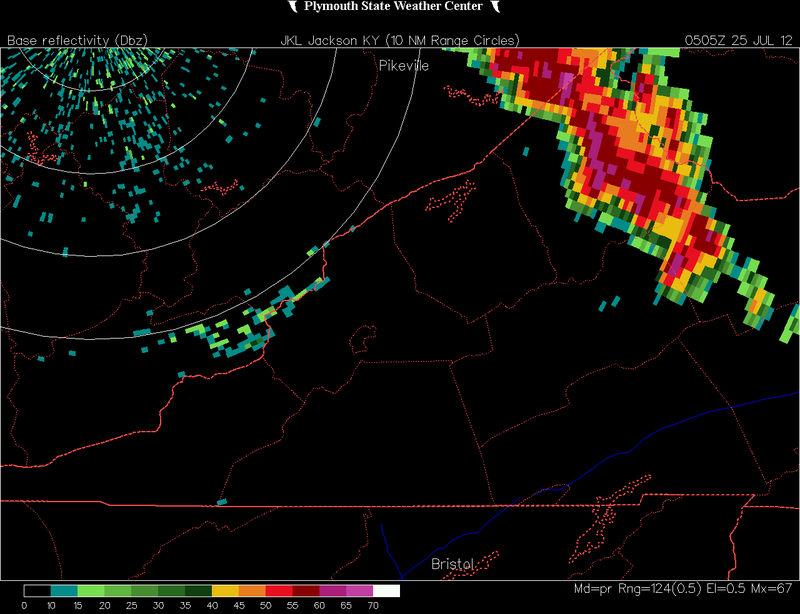 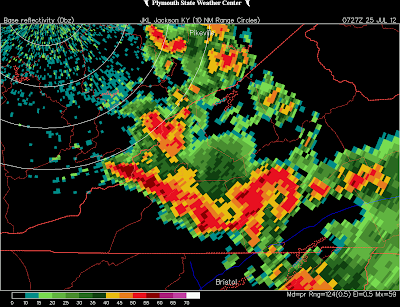 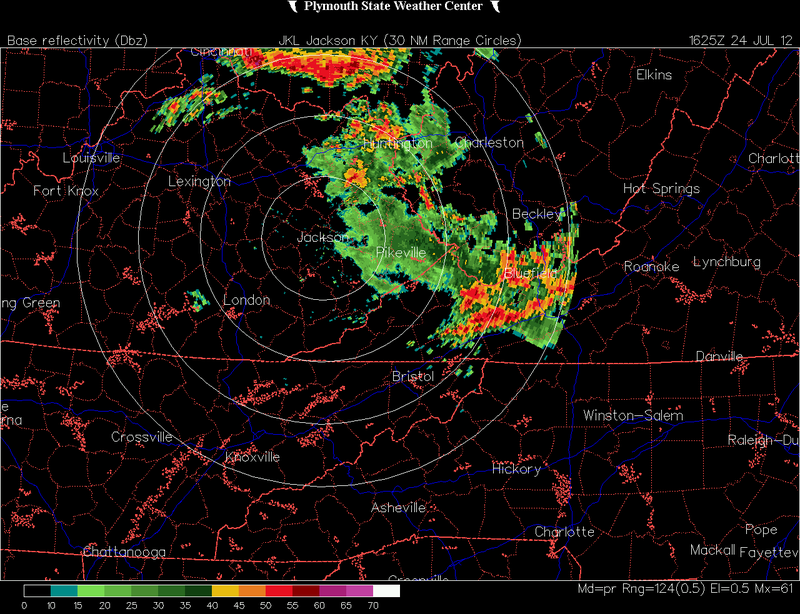 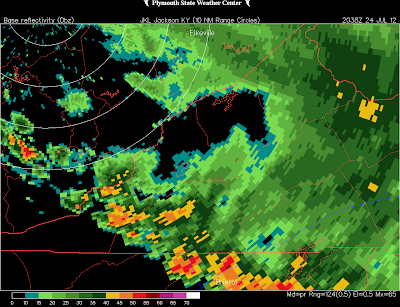 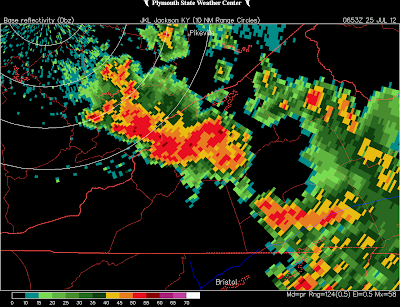 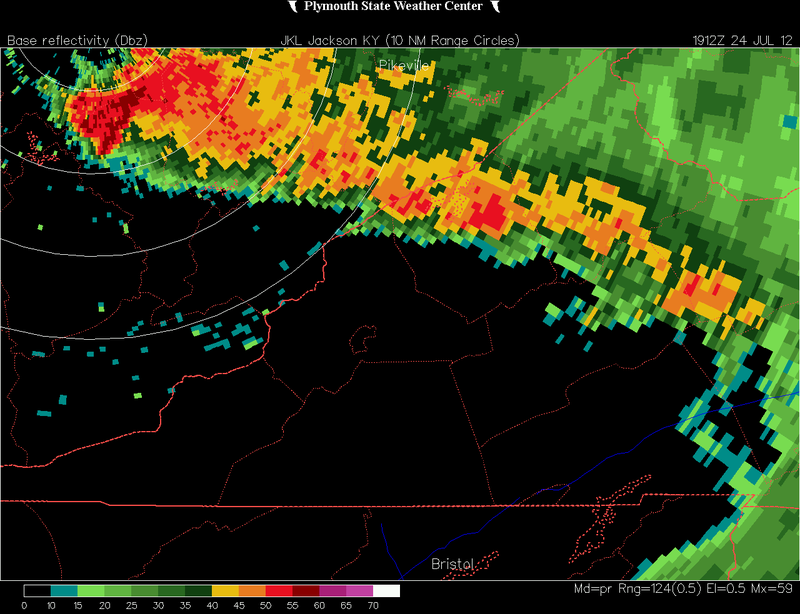 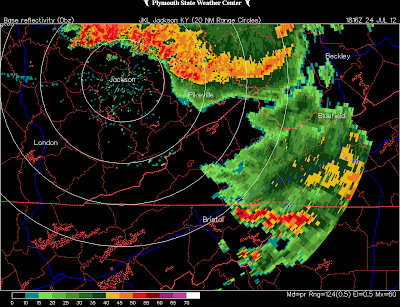 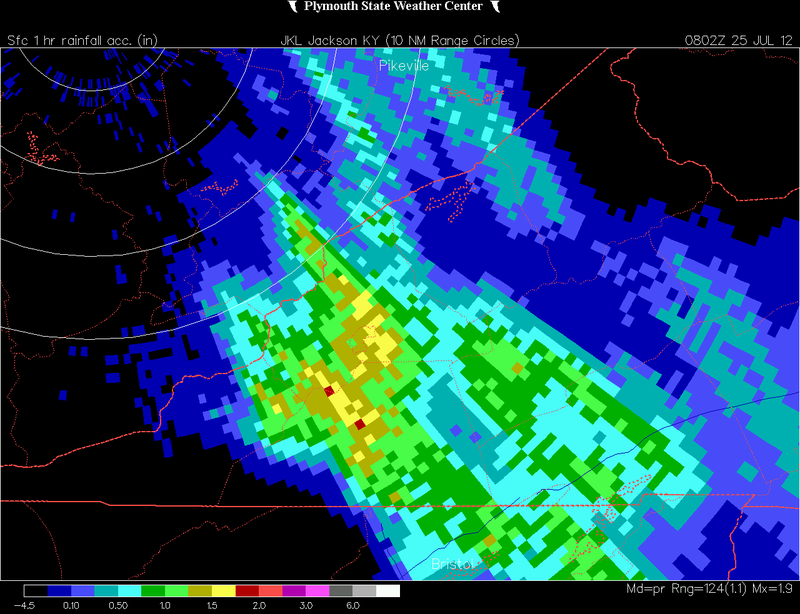 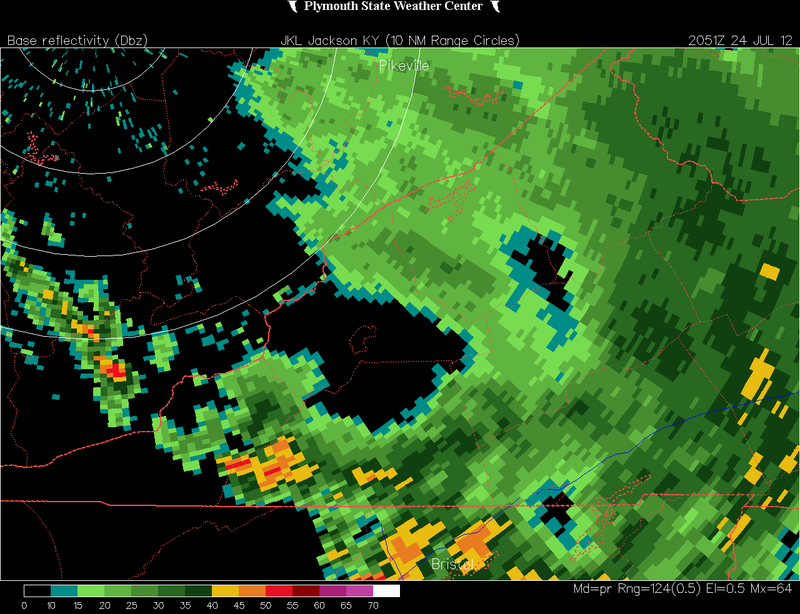 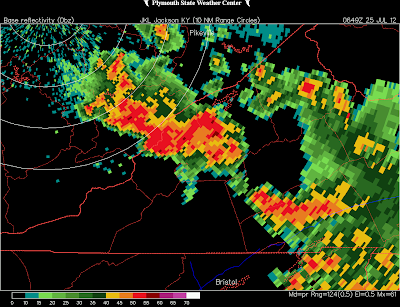 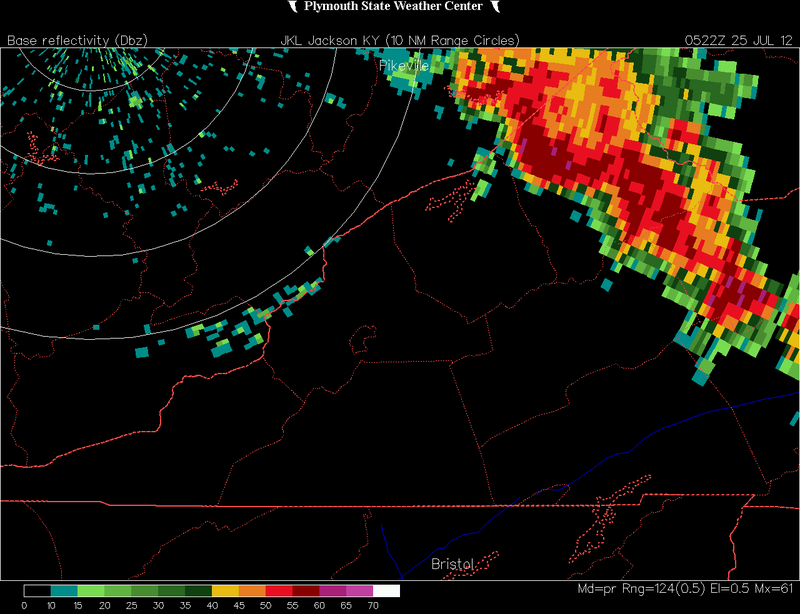 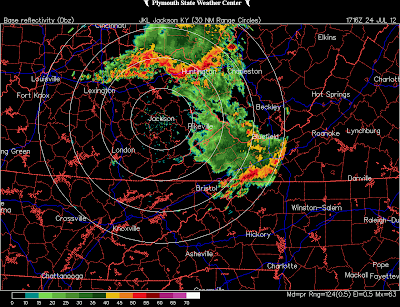 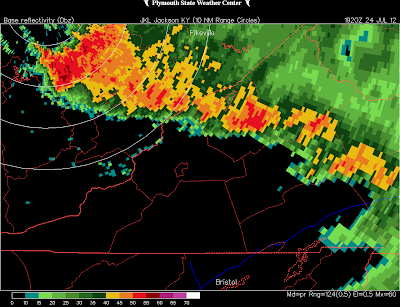 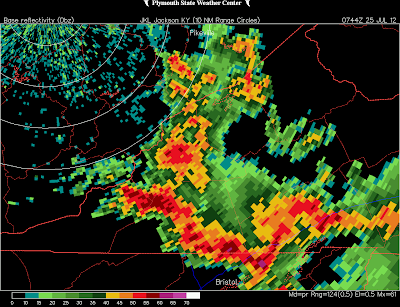 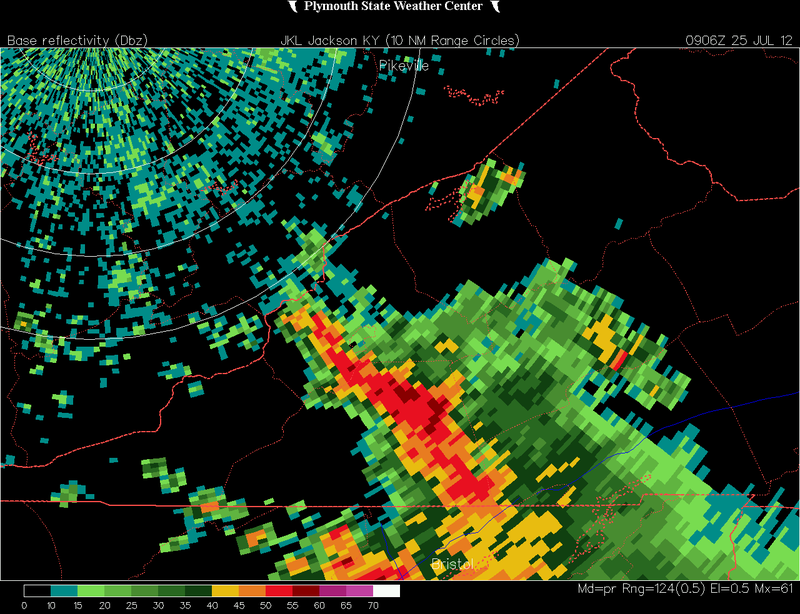 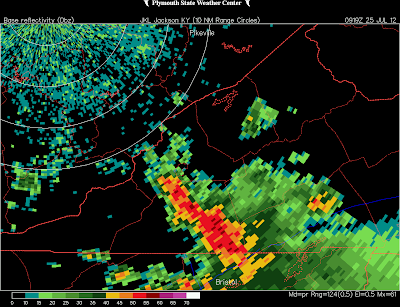 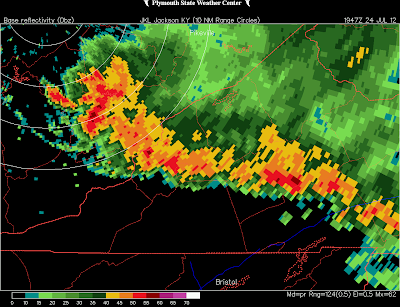 Additional development to the west converged along Cumberland Gap National Historical Park to bring heavy rains into western-central Lee County of the High Knob Landform during the next hour, with some backbuilding noted against the massif for a time to prolong heavy rain in the vicinity of Natural Tunnel State Park. 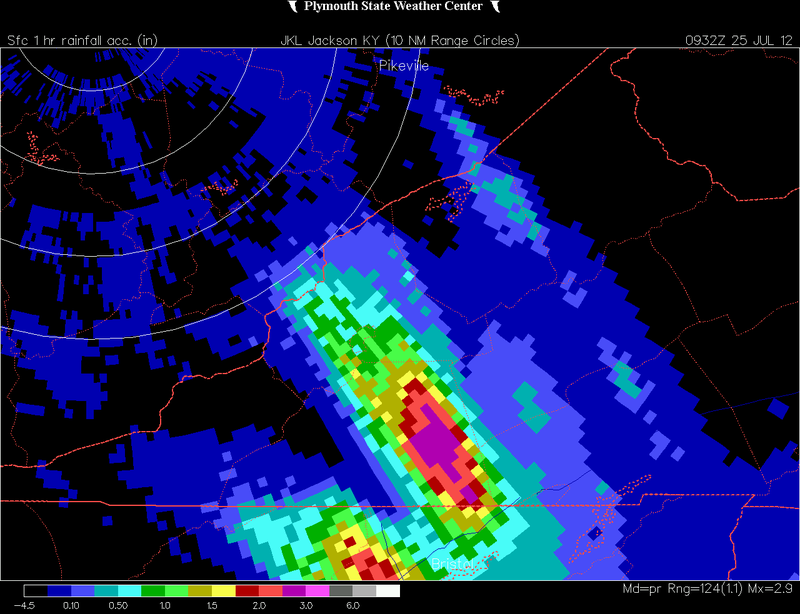 Big Stone Gap Water Plant: 1.11"
Robinson Knob of High Knob Massif: 1.26"
Appalachia Lake Water Plant: 1.53"
Natural Tunnel State Park: 1.73"
Although convection fired between July 19 and July 24, the next major event to threaten the mountain area was a long-lived Derecho that produced a path of wind damage stretching from northeastern Iowa and southern Wisconsin southward across the Ohio River into the southern Appalachians. 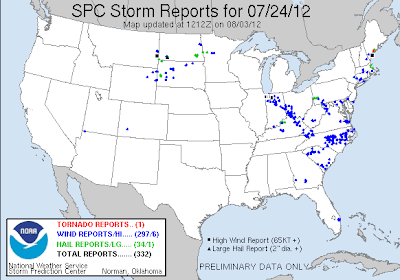 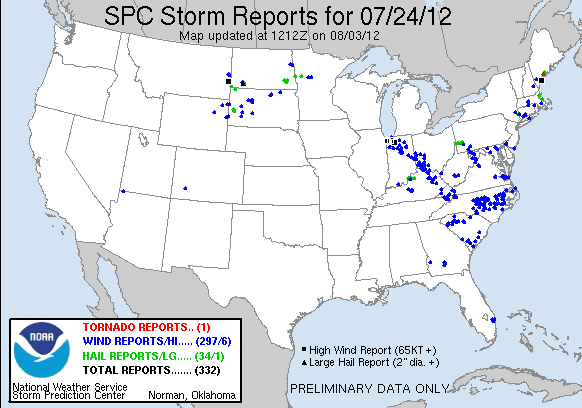 Wind damage and power outages became more localized from Dickenson and Wise counties into the Tri-Cities of northeastern Tennessee as the Derecho weakened over the higher mountain terrain of southwestern Virginia upon getting away from stronger, high altitude jet stream winds. 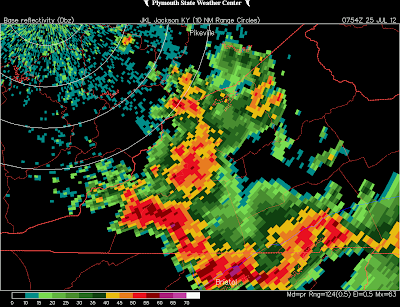 An initial wave of convection with heavy rainfall developed southeast along the Tug Fork Valley into central portions of southwestern Virginia, brushing the Cumberland Block, during the morning in advance of the Derecho squall line approaching the Ohio River by Noon. 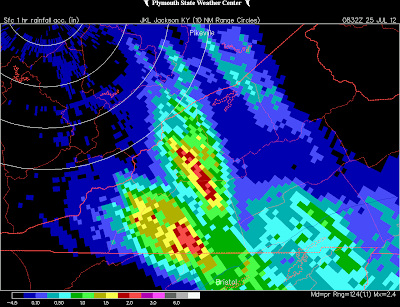 This next event caught many off-guard as nocturnal convection literally exploded amid the overnight hours of July 25 to generate what was arguably Mother Nature's most intense and dramatic display of lightning, torrential rain, and sheer output of power observed during this active, wild July of 2012. 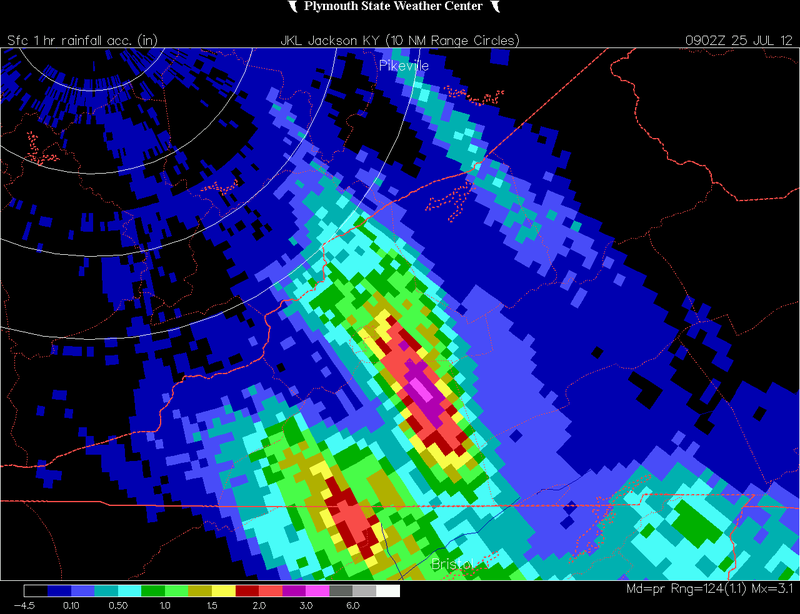 Clouds exploded upward like atomic bombs into the heavens to support intense thunderstorms, with Doppler measured tops rising 9.5 to 13+ vertical miles ( 50,000 to 70,000 feet ). 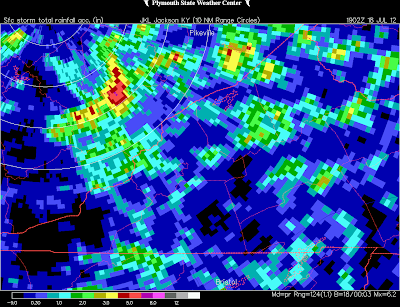 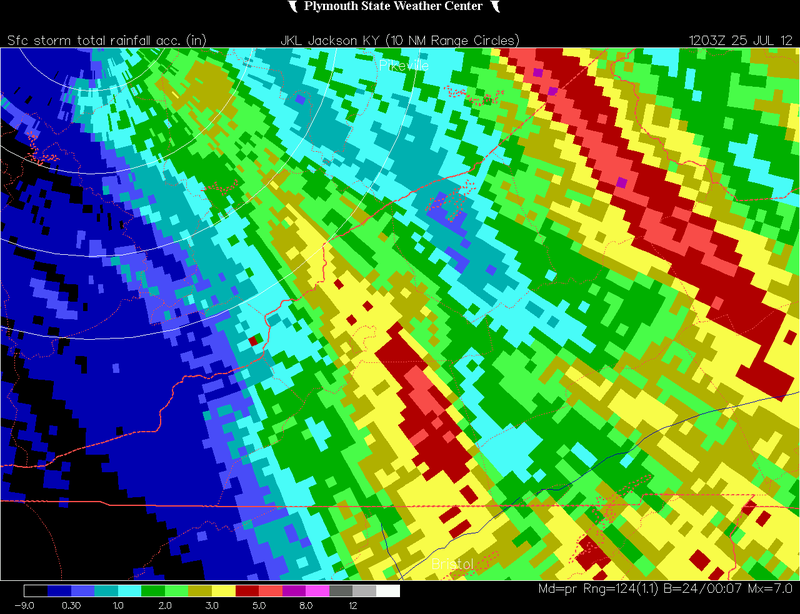 Flash flooding initially developed in Buchanan County but jumped across Dickenson County as intense thunderstorms developed along an outflow boundary and began training over the High Knob Massif of Wise & Scott counties, where steep creeks became raging torrents! 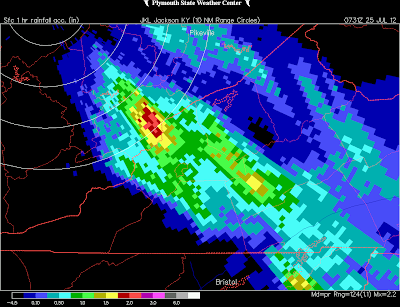 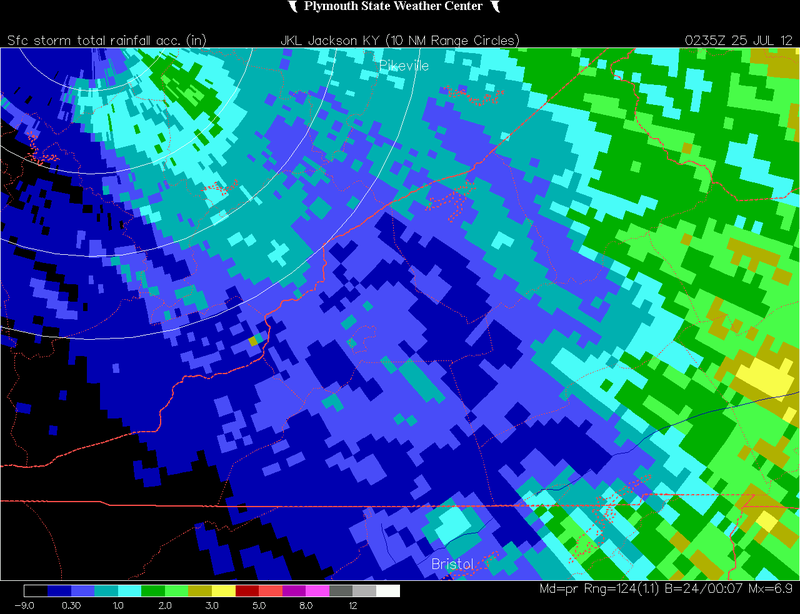 Predawn flash flooding developed along both sides of the Wise-Scott border to create a dangerous situation for many. [ Although officially remaining below flood stage, 10 vertical feet of water rise was recorded on the Clinch River downstream of the massif at the Speers Ferry gage in Scott County ]. 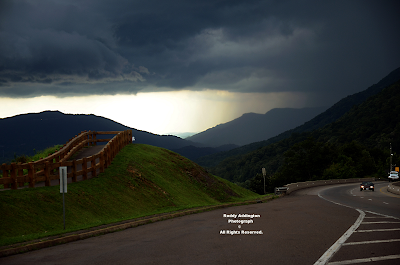 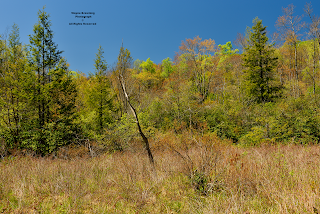 Appalachia Lake Water Plant: 1.28"
*Natural Tunnel State Park: 1.30"
Big Stone Gap Water Plant: 1.64"
Robinson Knob of High Knob Massif: 4.63"
*From automated tipping-bucket rain gauge. 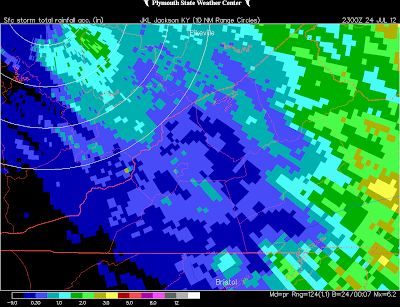 Actual total was likely higher.